A rock jock’s adventures in food, travel and high-octane spirits. My 12-year-old daughter’s at the age where she’s fascinated by the world of music. Working in radio, I’m lucky that I’m able to offer her some great experiences. Thanks to my boss, Rob, the man with all the connections, she got to meet her favorite band, AJR. She went backstage and met the guys from Imagine Dragons. She received a hand-written birthday greeting from Brendan Urie of Panic! at the Disco. I saw my first concert at the age of 17. It was Three Dog Night and T.Rex at the Nassau Coliseum on Long Island. My daughter has already seen more concerts than I did in my teens. 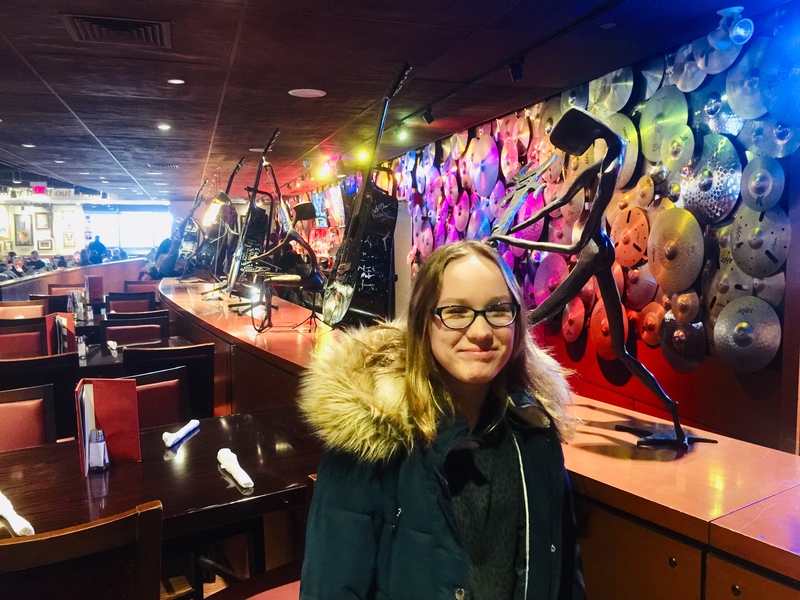 As touristy as they are (and as mediocre as the food is), Hard Rock Cafes and their walls full of pictures, guitars, photos and other memorabilia, offer a glimpse into the world of music that fascinates my daughter. Once she visited her first Hard Rock, the world’s largest at Universal Studios in Orlando, Florida, she was hooked. If we were traveling anywhere near a Hard Rock Cafe, we had to go. The Hard Rock at Universal was followed by New York City, Washington DC, the Cayman Islands, Paris, and Reykjavik. Yet we never made to the one in Boston, closest to our home in Rhode Island. It was time to go. 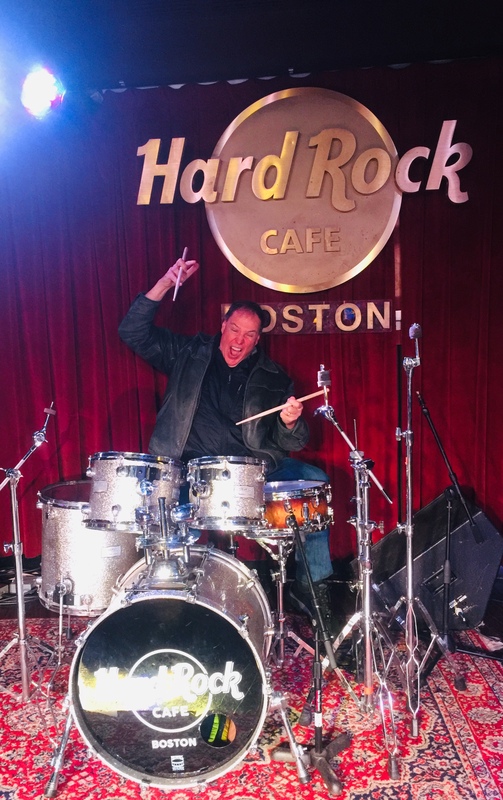 Our stay in Boston began with lunch at the Hard Rock Cafe, near Fanuel Hall. Nothing particularly amazing about the venue, but we could now scratch it off the list. I clearly don’t know what the hell I’m doing. Because our main point of going to Boston was to visit the New England Aquarium, I chose to get a room at the Marriott Long Wharf Hotel, located right on the water and literally a few steps from the aquarium. The area around Long Wharf includes many restaurant and shopping choices. 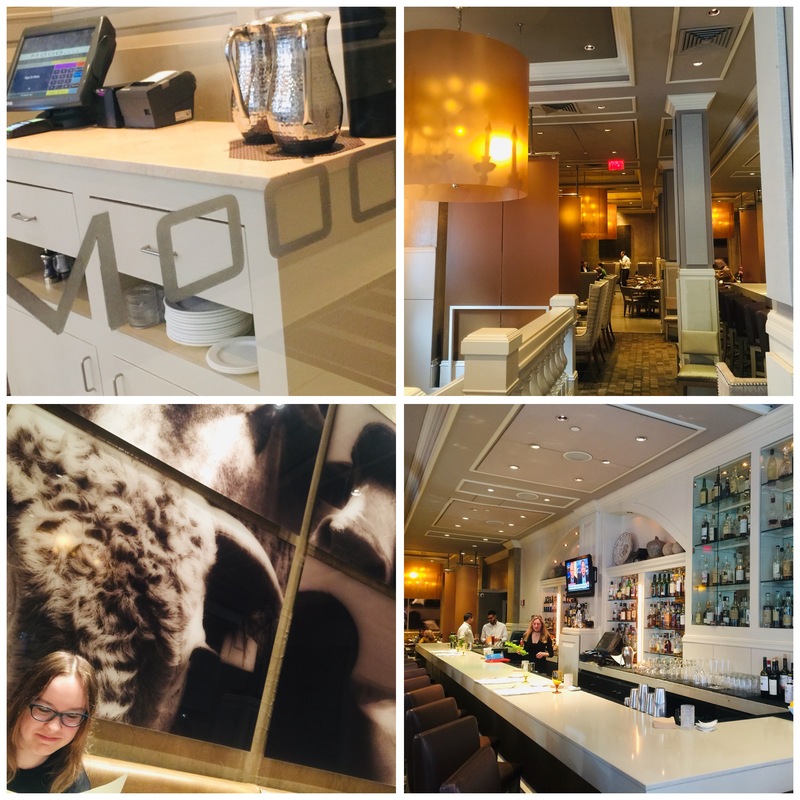 The Marriott Long Wharf is a huge hotel, and I was surprised at just how clean the property was, despite the vast numbers of people who were moving through the lobby and hallways. Our room was clean and technologically up-to-date: everything you’d want in a hotel room. Beds were comfortable, towels were plentiful. The only complaint I had about our hotel is one that I have with most of the Marriotts and Westins that I’ve been to recently. They’ve decided to make the move away from old-fashioned room service with carts, real plates and silverware, and decent food. Now they all offer what amounts to take-out service. You get a bag full of cardboard boxes that contain your meals….paper napkins…plastic utensils…and crappy food. I highly doubt all of this gets recycled. So in a world where we’re supposed to be thinking about how not to overload our landfills, these guys came up with the idea to make everything disposable. Really dumb. Goes without saying that we didn’t eat at the hotel. No carts. No fuss. No thanks. The New England Aquarium is a great place to take the family and see penguins up close. We arrived at feeding time, and it was fun to watch them eat; some of them fussy, some of them devouring their offerings of fish. The center of the building is a spiral, and inside the spiral is a huge 4-story aquarium. So as you slowly walk up the spiral, you get a constantly changing view of the aquarium and the thousands of fish and other sea life (manta rays, tortoises, sea horses, jellyfish, starfish, eels, seals, and lots more that thrive there. Again, you might be lucky to catch them at feeding time, when workers in scuba gear swim down to the different groups of fish and make sure they get fed. One note: buy your tickets online before you go. The outdoor line for last-minute ticket buyers was huge, and we visited on a bone-chilling winter’s day. Those people standing in line were very unhappy. We just walked right in with our online printed tickets. The Red Lantern in Boston. We don’t have many great Asian restaurant choices in Rhode Island, so when we go to Boston, it’s almost always on our list. 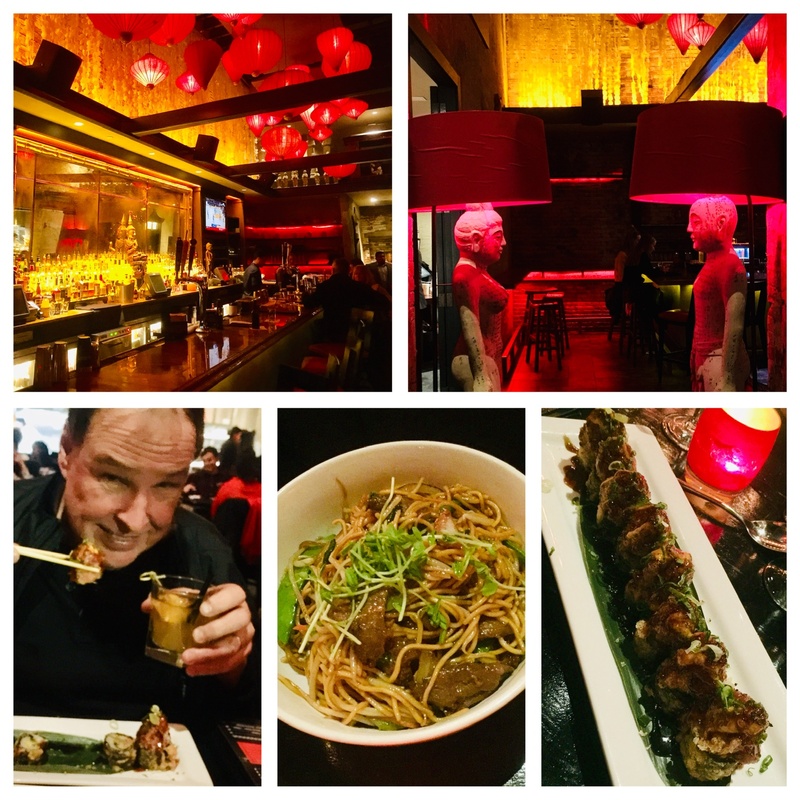 This time, we decided to skip Chinatown and go to a restaurant that was as much about the atmosphere as it was about the food: The Red Lantern. Great music, cool lighting, awesome design, very good food and a huge cocktail menu. My daughter had miso soup and a massive delicious bowl of beef lo mein. I shoved a few large chopstick-fulls into my mouth “for blogging purposes.” Really good. I started with a plate of boneless ribs, sweet and sticky. My main dish was a huge spicy tuna toro maki roll: a tempura fried roll with avocado, cucumber, chili soy and toro tuna, slightly torched. Over the top. The Red Lantern has a beautiful bar, and my original mai-tai was well-made, though very sweet. Dessert selections weren’t what we wanted…and we needed a breather…so we Ubered over to Newbury Street, where we found a wonderful gelato shop: Amorino. It’s an Italian chain, and they know how to do gelato! I suppose if I wasn’t hanging out with my daughter, I’d take this opportunity to go to a bar for one last cocktail, but instead, we just went back to the hotel and focused on the next day, thinking we’d hit the indoor pool. Turns out it wasn’t a great idea, because the pool last the Marriott Long Wharf was really small and full of screaming little kids. Plan B: find a really great Sunday brunch. Mooo is a steak restaurant inside the beautiful XV Beacon Hotel, on historic Beacon Street. 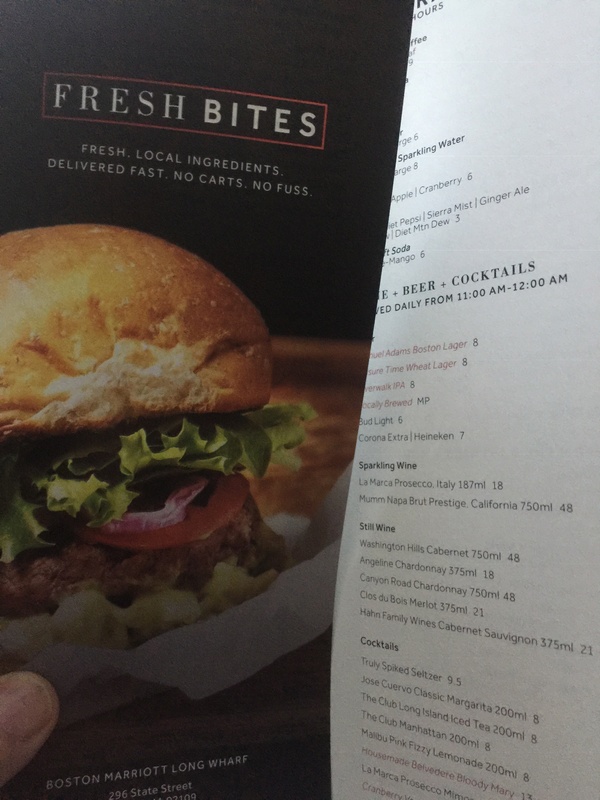 As I was searching for brunch possibilities, I saw the tempting list of freshly-baked treats on their menu, very different from those offered elsewhere, and I knew this was where we needed to go. We were not disappointed! 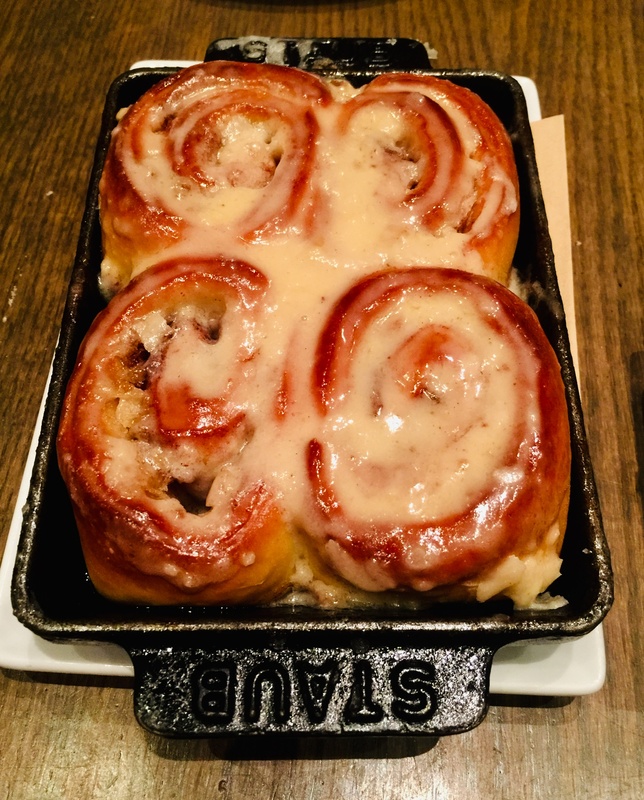 The incredible cinnamon buns at Mooo. My daughter knew almost instantly that she was going to have the chocolate chip pancakes…with a side of bacon, of course. I was contemplating the lobster eggs Benedict (I’m a huge fan of bennies), but then I said to myself: “Wait…this is a steak restaurant. 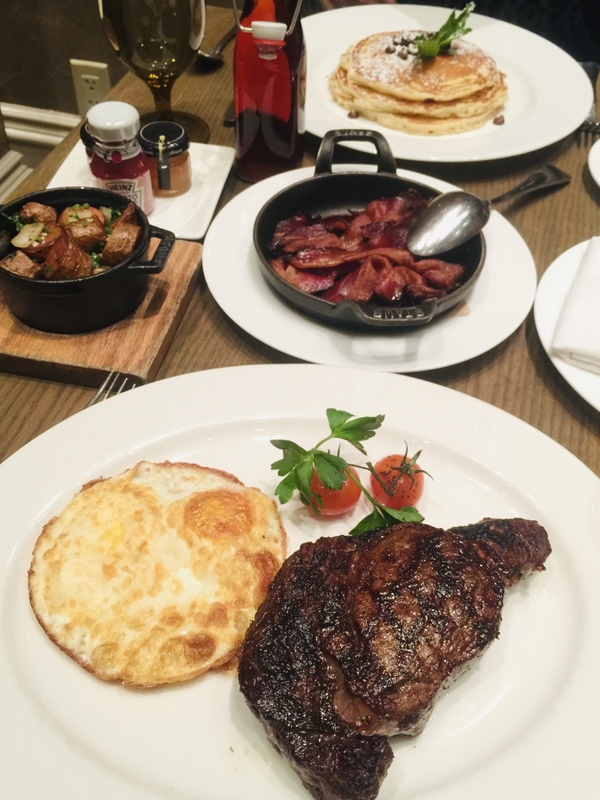 They have half-a-dozen steak and eggs offerings on the menu. Have a steak, for crying out loud!” My inner voice served me well. I had a choice of 2 ribeyes: either a 12-oz. American corn-fed ribeye, or a 14-oz. pastured, grass-fed Australian ribeye. I’m a grass-fed guy, so the larger Australian ribeye (which was also less expensive) was a no-brainer. It was cooked to a perfect medium-rare, and was one of the best steaks I’ve had in a very long time. A couple of eggs and a side of perfectly cooked potatoes made for an ideal meal. Mooo was such a great choice for brunch that I will keep it in mind for dinner on a return trip to Boston. We returned to our hotel after brunch, simply to pack up and head home. A nice 24-hour getaway with wonderful food and a fun time with my daughter. I know my daughter and I will be back in June to see a Billie Eilish concert at the Rockland Trust Bank Pavilion, so we’ll have more opportunities to hit a couple of restaurants, this time in the Seaport District, which, sadly, is being overrun by so much new construction that you can’t even see the water anymore. It’s sad because Boston’s traffic has just been rated the worst in the country, and this will only add to a crumbling infrastructure that is already overloaded. I have to give credit for this recipe where it’s due. 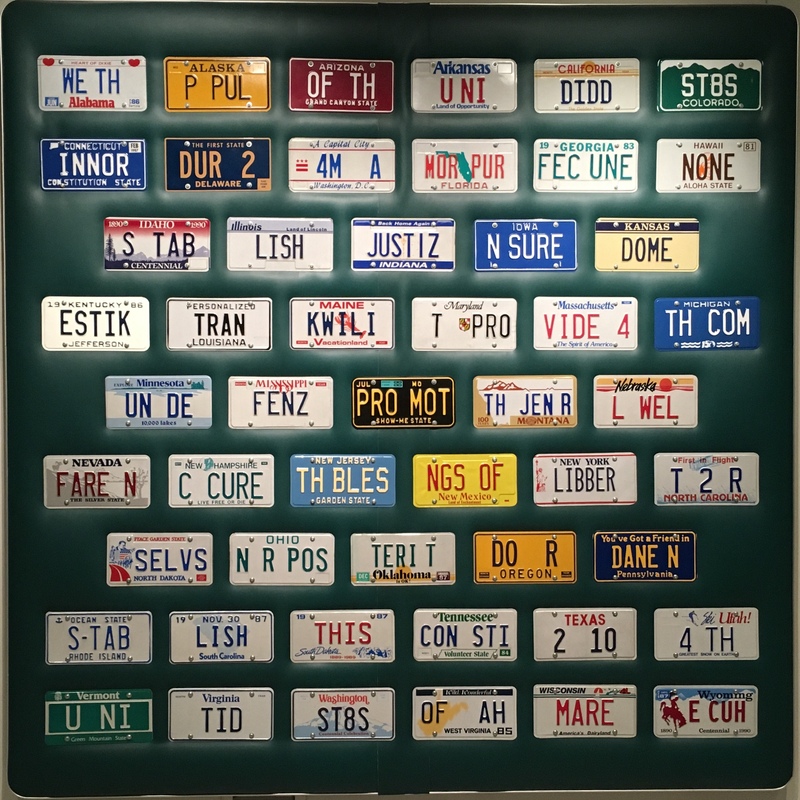 Last year, we traveled to Washington, DC and one of our best dining experiences was at the Blue Duck Tavern, a stunning restaurant matched by its unique and beautifully prepared plates. It is the restaurant I recommend to any friends in the DC area, and one I would go back to in a heartbeat. One of the incredible appetizers I enjoyed was the roasted beef bone marrow, which had a delicious pretzel crumble on top. The moment I had a taste, I knew that I would have to recreate this for myself. 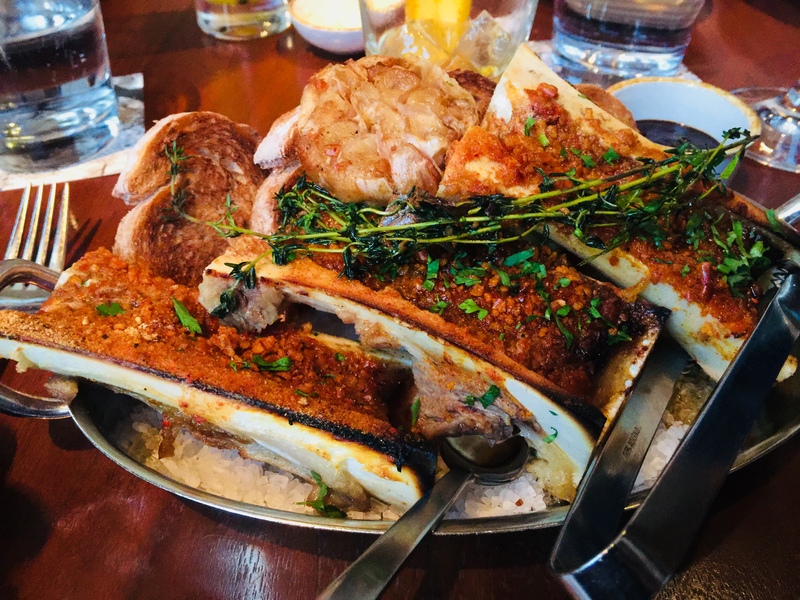 The amazing bone marrow plate at the Blue Duck Tavern in Washington, DC. Bone marrow played an important role in the evolution of early man. Perhaps that’s why some of us still have that primitive craving for it. Early man had small teeth and ate anything he could lay his hands on, especially meat. But he was no hunter. Attracted by circling vultures, he probably scavenged the leftovers from a big kill such as an antelope left in a tree by a leopard, or a large animal such as a wildebeest that had been slaughtered by lions. Because meat is relatively easy to digest and rich in calories and nutrients, early man lost the need for the big intestines of apes and earlier hominids. This freed up energy for use by other organs. This surplus of energy seems to have been diverted to one organ in particular – the brain. But scavenging meat from under the noses of big cats is a risky business, so good scavengers needed to be smart. At this stage in our evolution, a big brain was associated with greater intellect. Big brains require lots of energy to operate: the human brain uses 20% of the body’s total energy production. The concentrated calories and nutrition found in meat was responsible for an increase in the brain size of early humans. But around two million years ago, telltale cut marks on the surface of animal bones reveal that early humans were using crude stone tools to smash open the bones and extract the marrow. Stone tools allowed early man to get at a food source that no other creature was able to obtain – bone marrow. Bone marrow contains long chain fatty acids that are vital for brain growth and development. This helped further fuel the increase in brain size, allowing our ancestors to make more complex tools. Many historians believe that the blunt force required to break bones with tools to extract the bone marrow was a crucial ingredient in the development of the human hand, and the unique dexterity it has over that of apes. 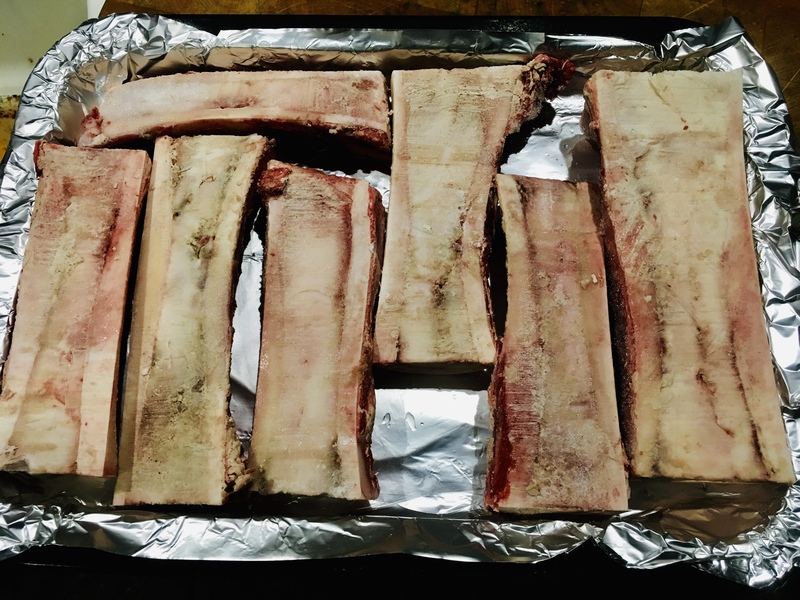 Of course, these days, we can simply go to our butcher and ask them to slice some beef bones for us so that we can enjoy the marrow like our ancestors did. It’s much more civilized. My box o’ frozen bones. I ordered about 25 lbs. 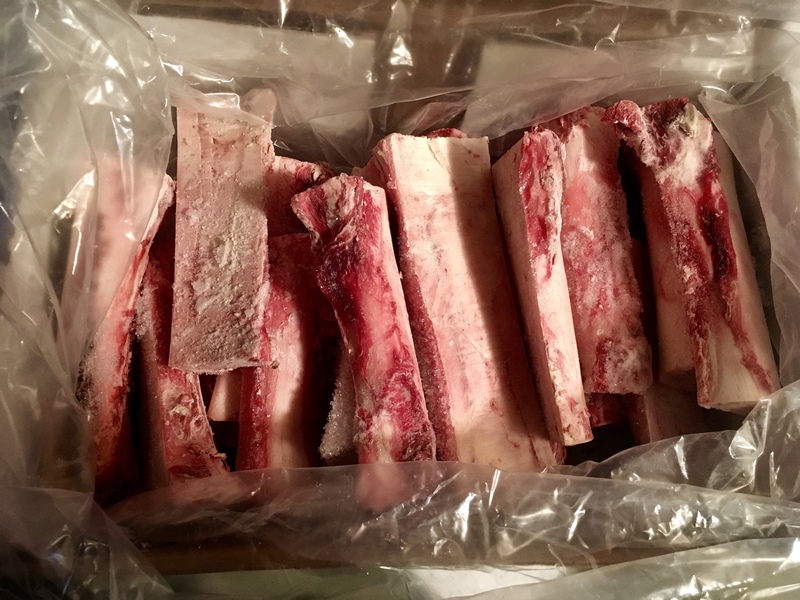 of marrow bones from a grass-fed beef farm in Texas. They key to roasting marrow bones properly is to keep an eye on them. 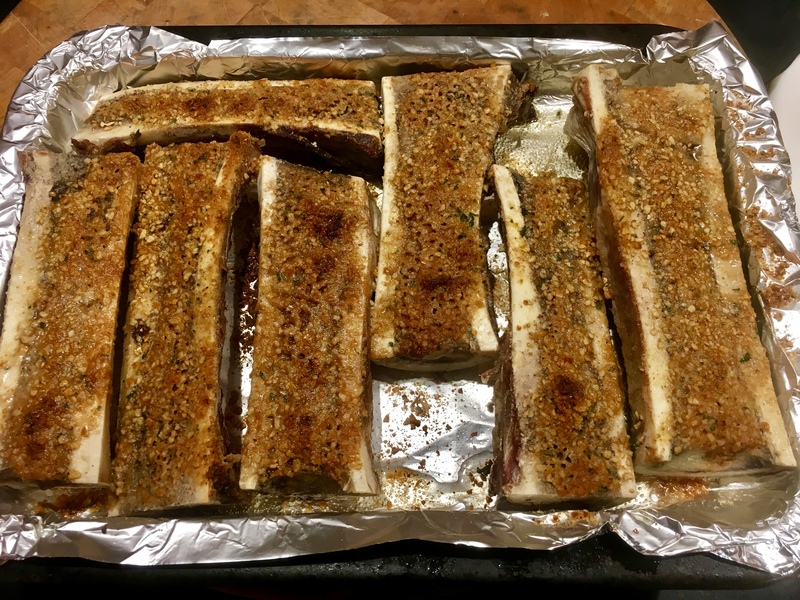 The bones can go from frozen solid to blazing hot in no time, and that means the marrow can go beyond its rich, gelatinous perfection into a puddle of fat at the bottom of your pan in mere moments. I keep the beef bones frozen, moving them to the fridge until I’m ready to roast them. Pre-heat the oven to 450 degrees. 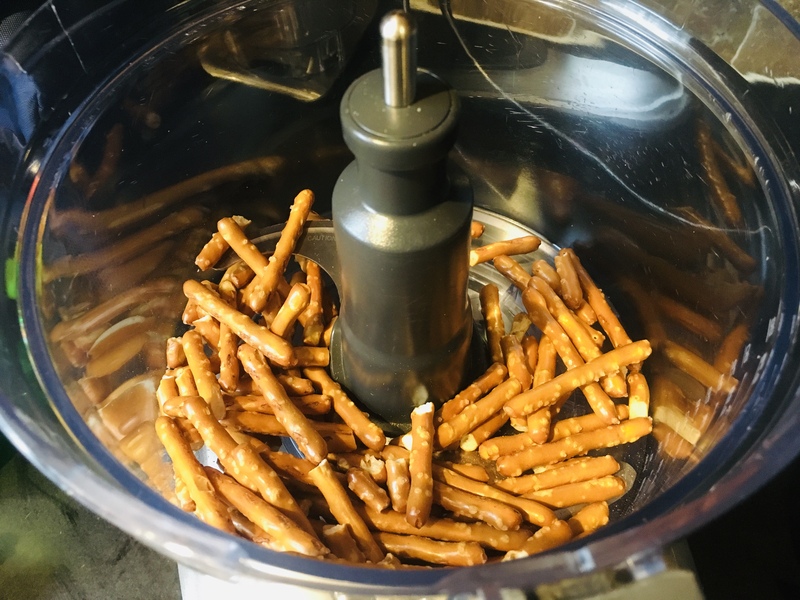 Place a handful of salted pretzel sticks in a food processor, and pulse them until the pretzels are ground fine. When you’ve got 3/4 cup of ground pretzel powder, move it to a bowl and add the parsley, onion, garlic and black pepper. No salt is needed if the pretzels are salted. 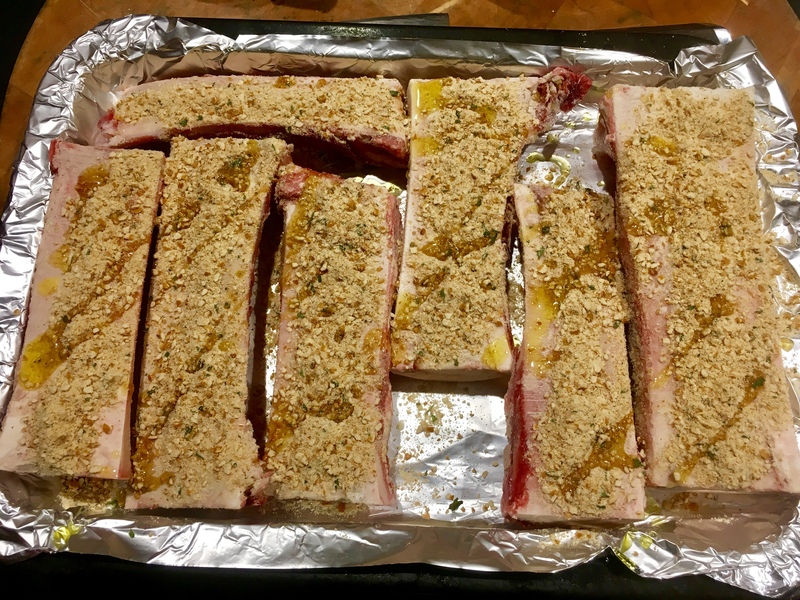 Lay the bones flat on a baking pan. If they wobble, place them on a layer of coarse salt to hold them steady. Sprinkle the pretzel mix on the bones, a little drizzle of olive oil on top, and place them in the oven. Now you watch…there’s that one point where they go from “not quite yet” to perfection to “Oops! Too much!” …so be careful! Some toasted bread on the side is all you need! If you’re cooking gluten-free, try Snyder’s of Hanover GF pretzels. They are awesome…you’ll never know the difference. Though it may sound Japanese, the word “saganaki” refers to a small frying pan used in Greek cooking. The most famous of these dishes, simply called saganaki, is a fried cheese, often flamed at the end with a little ouzo. 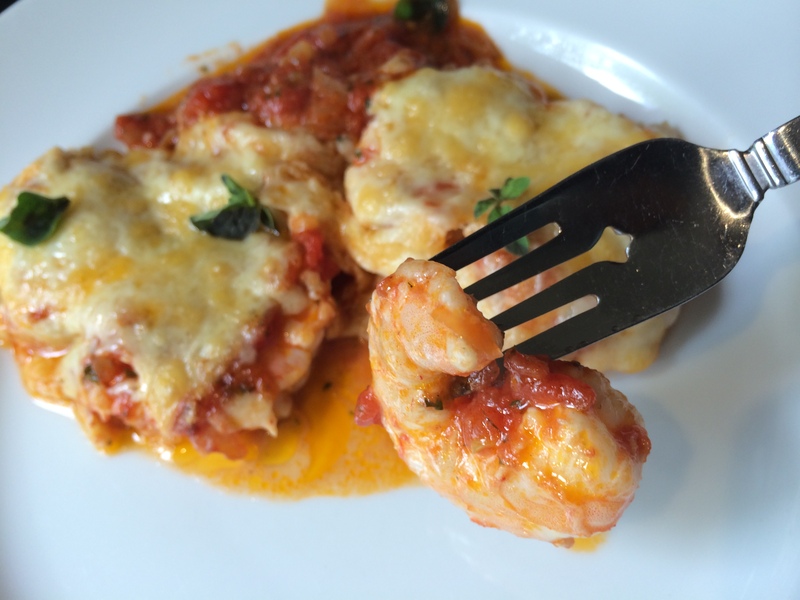 Shrimp saganaki is one of my favorite Greek dishes, and it usually involves cooking shrimp in a tomato-based sauce with plenty of feta cheese sprinkled in. It’s simple yet fantastic if the ingredients are fresh. Doesn’t hurt to be sitting in a taverna on the beautiful island of Santorini while eating it, either! You can find Graviera cheese in most supermarkets. 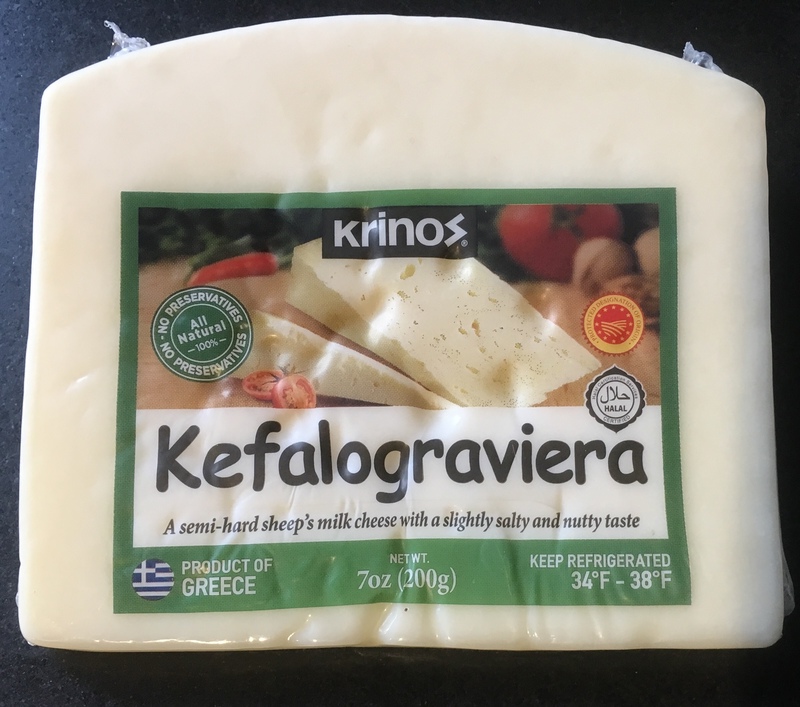 I found a slab of Graviera cheese at a local supermarket, and decided to recreate shrimp saganaki using that instead of feta. It was pretty damn amazing. I like using 24–30 shrimp, because larger shrimp don’t always cook through. These smaller shrimp will be bite-sized and delicious. Peel and de-vein the shrimp (or you can buy them that way already.) Squeeze the juice of 1/2 of a lemon on to the shrimp and toss. Set aside. In a large pan, saute the onions in the olive oil until translucent. Add the garlic and cook for a few seconds more. Crush or puree the tomatoes and add to the pan. Add the red pepper flakes, dill and oregano, and salt and pepper. Add the Ouzo. Let this sauce cook down for a bit until all the flavors have blended together. Pour a layer of the sauce on the bottom of a metal broiler-proof pan. Lay the raw shrimp in a single layer into the sauce. Cover the shrimp with the rest of the sauce and sprinkle the grated Graviera on top. Place the pan in a pre-heated 350-degree oven and bake until the cheese is golden brown and bubbly and the shrimp have cooked through. It takes a few weeks for this limoncello recipe to be ready, so plan ahead! Many years ago, my wife and I visited the Amalfi coast, and we spent several nights on the beautiful island of Capri. On our last night, we dined at the historic Grand Hotel Quisisana, and our meal ended with a glass of the most delicious limoncello I ever had. 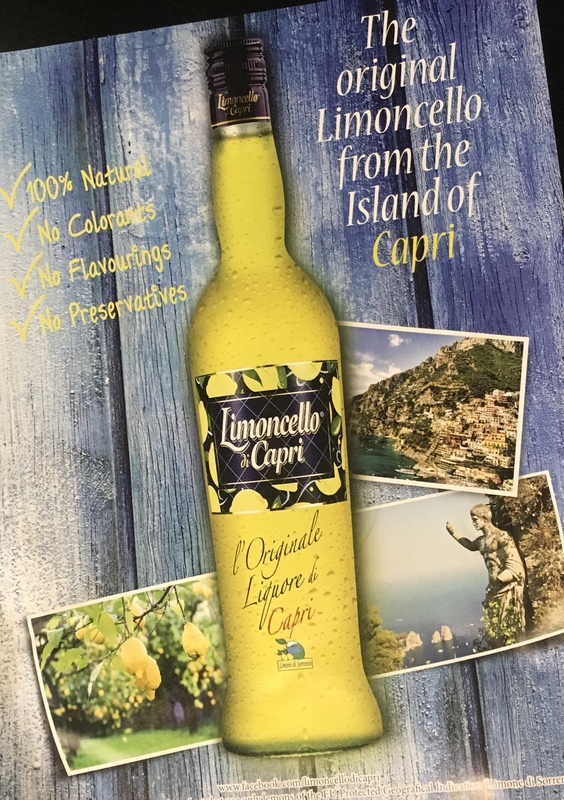 I asked the waiter if it was possible to get the recipe of the limoncello, and he made a big deal about the recipe being a “secret.” Though disappointed, I understood, and I left Capri thinking that I would never taste it again. Sure, you can buy limoncello from Capri in a bottle, but what fun is that? Two weeks later, now back at home, I was reading the latest issue of Conde Nast Traveler, and there in black and white, was the Quisisana limoncello recipe! WTF? 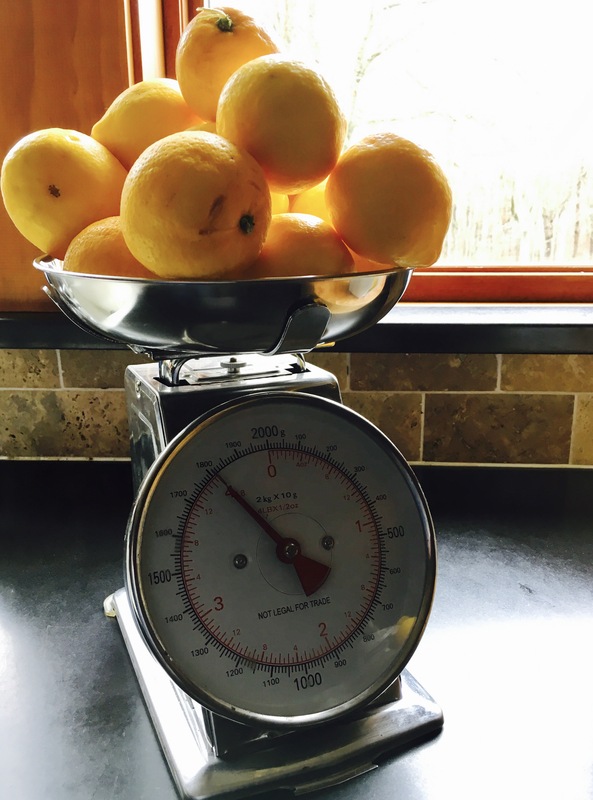 After making many batches of this limoncello, I started experimenting with other citrus, and the most successful by far was with grapefruit. 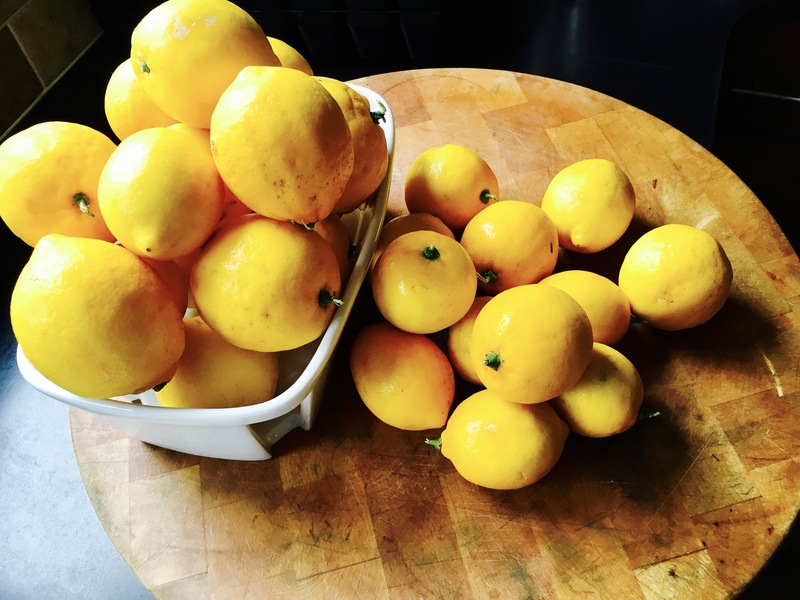 Now I make a batch of each–lemon and grapefruit–every year. It’s important to use 100-proof vodka in this recipe. Most vodka is 80-proof, so you’ll need to go to a liquor store with a better selection to find it. Absolut makes a good one, as does Stoli. Four ingredients, easy to make. The toughest part is waiting for it to mellow a bit. 4 lbs. of lemons, but you only use the zest! Peel the zest off all the lemons, making sure you don’t get any of the white pith that could make the limoncello bitter. Place all the zest in the bottom of a glass jar with a lid that can hold all the vodka. Pour the vodka on top of the lemon zest pieces, seal the container, and keep it at room temperature for a week, swirling the jar around gently once a day. 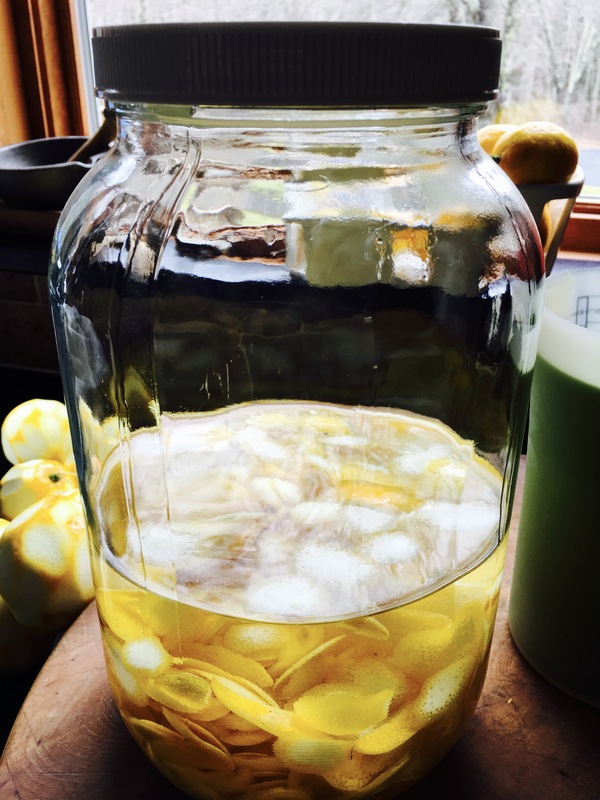 On day seven, strain the lemon zest, pouring the infused vodka into a clean glass jar. 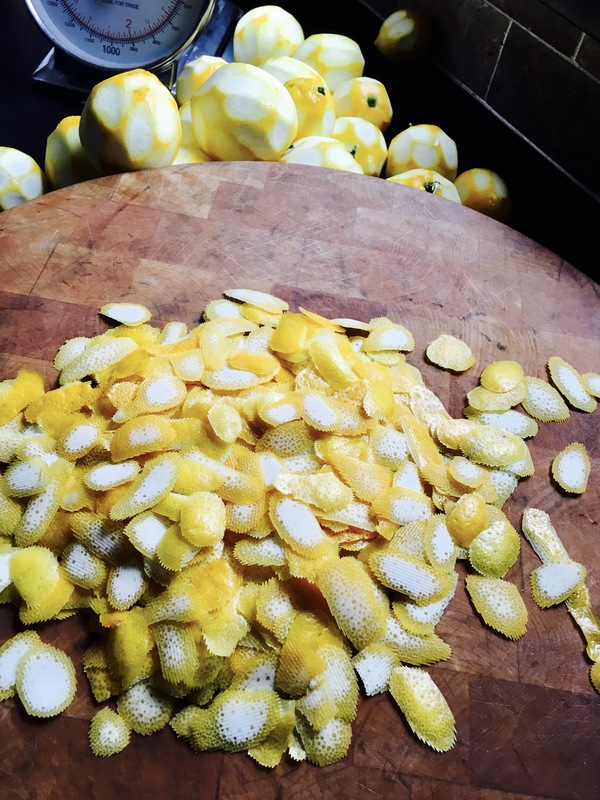 Discard the lemon zest. Pour the sugar/water mixture into the vodka and mix well. At this point, you can pour the finished product into bottles, but let it mellow for about a month before drinking. I keep my limoncello refrigerated. My home town of New York is the greatest city in the world. 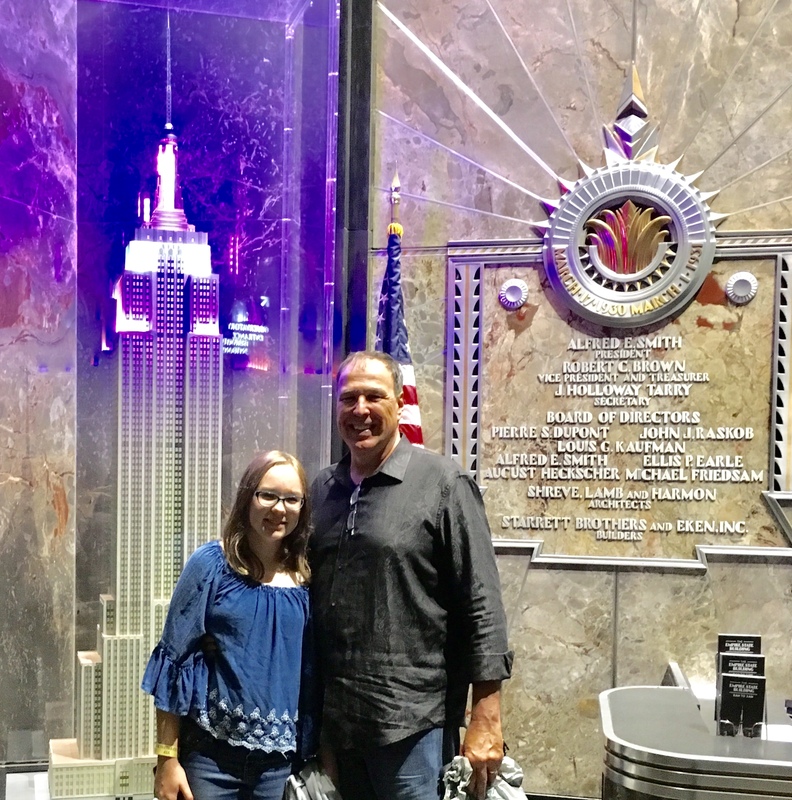 Over the years, I’ve brought my daughter to the Big Apple to experience the amazing sights it has to offer. 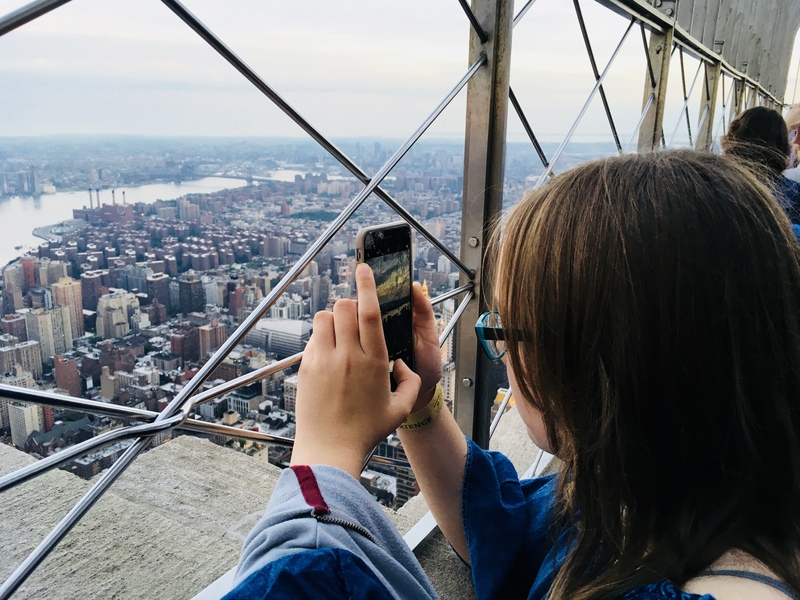 We’ve done the museums: from the Guggenheim to the Museum of Modern Art to the Whitney…from MOMA to the Museum of Natural History and the Rose Science Center. Last year, we visited the Statue of Liberty, Ellis Island, and One World Trade Center. We decided that the Empire State Building was long overdue. 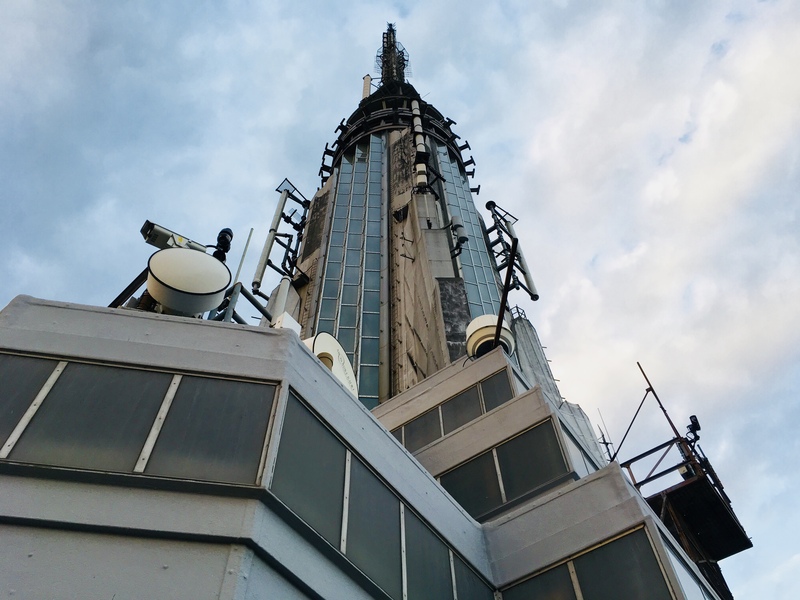 The Empire State Building is an art deco skyscraper that, at 102 stories, was the world’s tallest building for over 40 years. 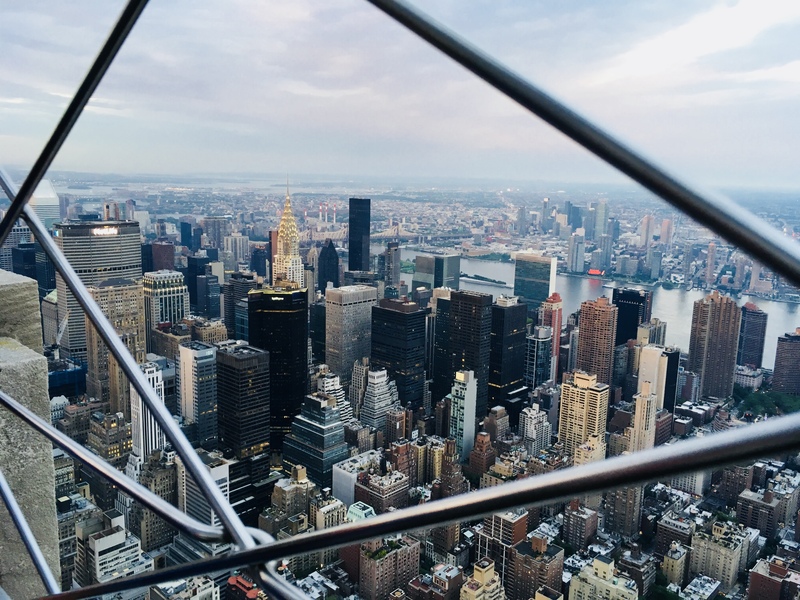 Over 4 million people visit it every year, so I’m going to give you a few important tips that are good to know if you’re planning a trip sometime soon…and you really should go. The most important tip I can give you is: buy the VIP Express pass. You can only get them online here: http://www.esbnyc.com/buy-tickets. They cost more, but the time you don’t waste and stress you avoid is worth every penny. Facing south: One World Trade Center in the distance, with a very tiny Statue of Liberty to the right of it. 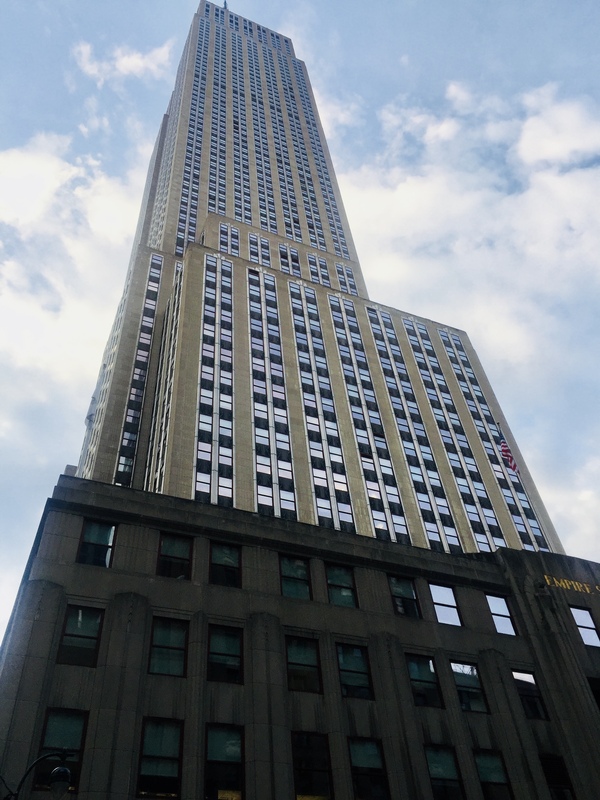 It doesn’t matter how crowded it gets (and sometimes, the line for tickets to the Empire State Building goes out the door at 5th Avenue and 33rd, and around the corner all the way to Macy’s! )…if you buy the VIP tickets, you won’t be standing in that line! Of the thousands of people who were visiting on a recent Saturday evening, we were 2 of only 3 people with VIP passes! We walked up to the door and told the security guard that we had VIP passes, and he let us right in, past everyone, to another guard who led us to an escalator to the elevators. When we reached the top of the escalator, we again mentioned we had VIP passes, and they led us to another guard who gave us wrist bands after scanning the tickets we purchased online, and told us: “Show your wristbands to everyone as often as you can.” He meant it! One wave of the wristband, and we were the first to go on the elevator to the 80th floor, where you walk through the “Dare to Dream” exhibit, on your way to the next set of elevators that take you to the outdoor observatory on the 86th floor. Again, there was a line of hundreds of people ahead of us, and again, we waved our wristbands and were escorted to the front of the line and right onto the elevator. From the street to the 86th floor, it took us a total of 10 minutes! Worth every penny of the $65 we paid per ticket. 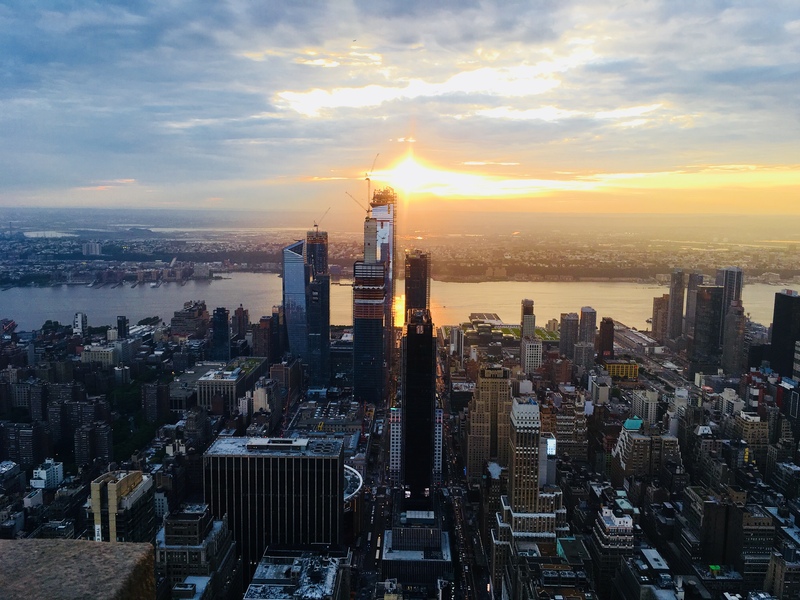 The 86th floor has an enclosed area, but everyone wants to be outside, where the only thing between you and a long drop down to the street is a fence. We were there at sunset, and the city looked spectacular. We chose not to go to the observatory on the 102nd floor (that would’ve required a different ticket purchase), but I had been there before, in my youth. Enclosed by glass and very small, it’s a little eerie up there as the building creaks and sways slightly from side to side in the wind. 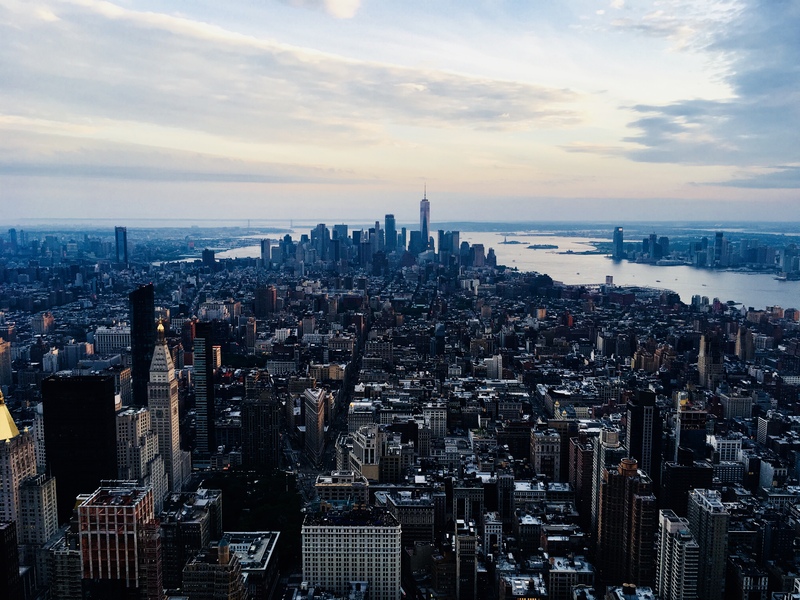 An old-style elevator takes you up from the 86th floor, and it’s something you should experience once in your life. My daughter didn’t seem too keen on going, so we passed on it this time. Looking up from the 86th floor to the top: dizzying! Of course, what goes up must come down, and that includes the hundreds of people at the top of the building! Once again, wristbands to the rescue: one wave, and we were put on the first elevator down to the 80th floor, where the gift shop was located. One more wave of the wristband, and we were the first on an elevator taking us back down to street level. The VIP Express pass rocks! 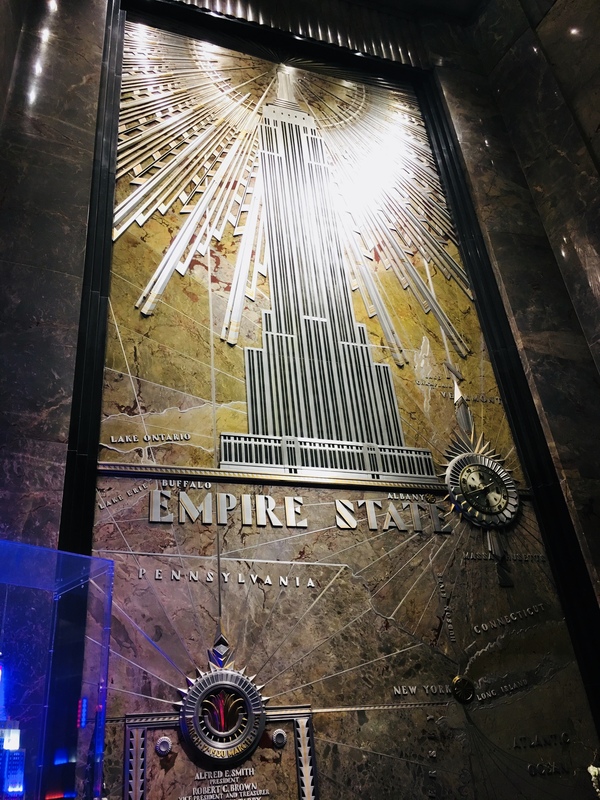 I will never go to the Empire State Building any other way…and neither should you! I’ve got a pizza bucket list. I’ve been to Lombardi’s. Al Forno in Providence claims the rights to the first (and some argue the best) grilled pizza. Dying to go to DiFara’s in Brooklyn…Pizzeria Bianco in Phoenix. And I’ve tried going to Frank Pepe’s original location in New Haven, CT for years. Right off Rt 95, it’s easy to get to, in New Haven’s Little Italy neighborhood on Wooster St. The problem was, every time I stopped by, the line was down the street and parking was impossible. Take-out was not an option. My first visit had to be inside, at a table. My chance finally arrived recently, when my daughter and I were returning home to Rhode Island from a weekend in New York City. It was a cloudy Sunday afternoon. I found a parking space…we were third in line at the door…could we really be going inside Frank Pepe’s? Yes!! Our booth was literally one step in and a step to the right. Boom. We sat. We looked around. We breathed it all in. It was loud. People were happy. They were eating pizza! Soon it was our turn to order. 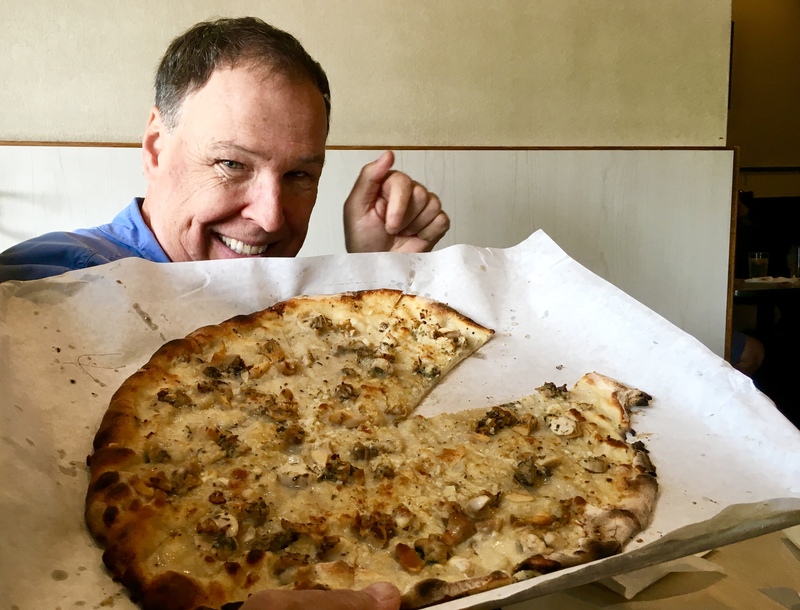 I had no choice but to order a white clam pizza, the stuff of legend at Frank Pepe. That had to be my first bite there. My daughter ordered a large margherita pizza…and we were off! We started by sharing a Caesar salad. Good…but not why we came here! 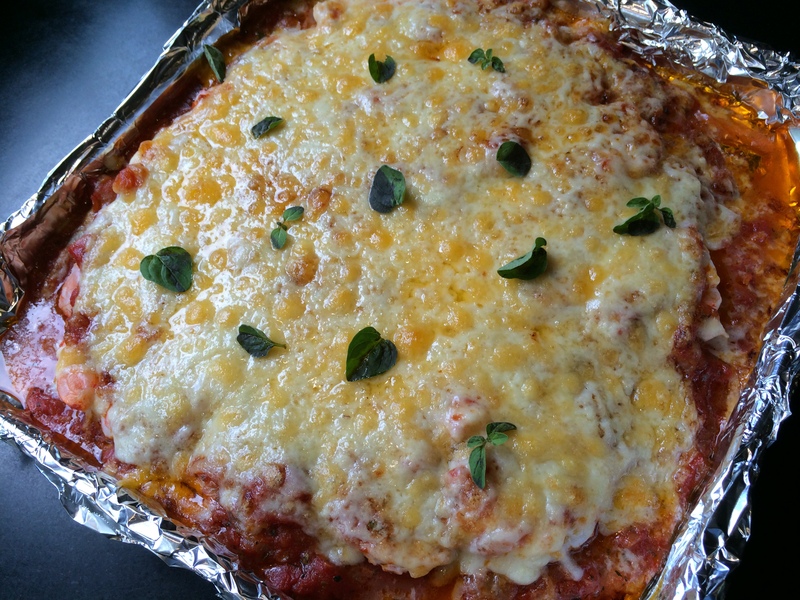 Soon, the pies arrived…the margherita came first, served on a large rectangular sheet pan, not the standard round pizza pan. And it was HUGE. We didn’t have a problem with that! It looked and smelled amazing. 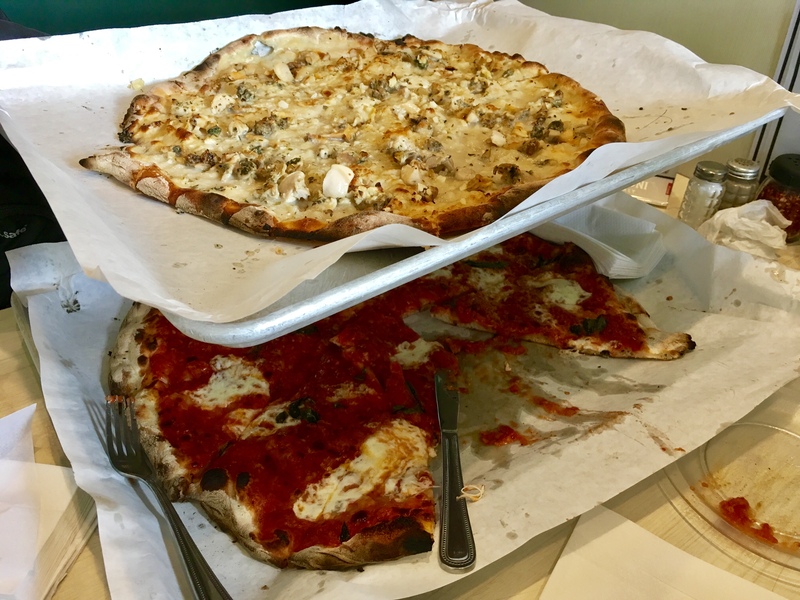 Moments later, our server brought out a metal frame that allowed for a second level of pizza…and my white clam pie arrived! 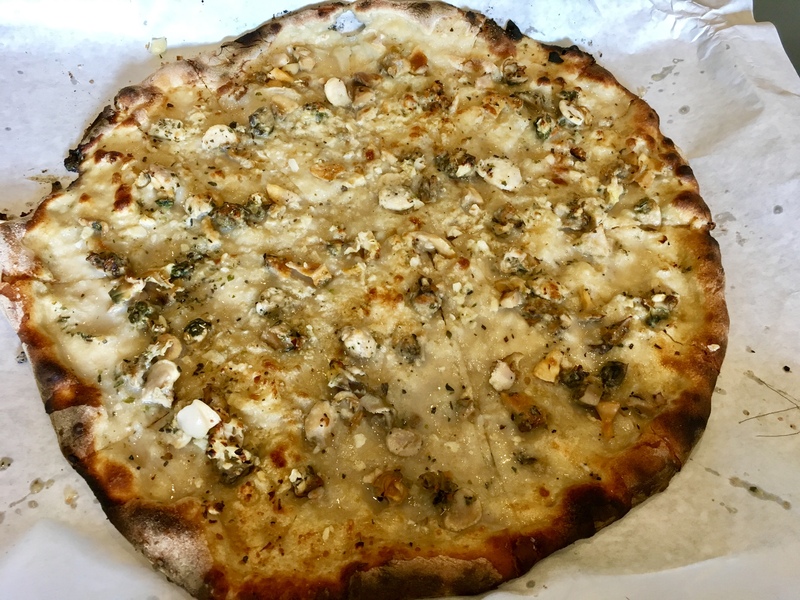 The white clam pizza is so simple: a thin crust, fresh clams, olive oil, some cheese, oregano. But the oven…that magical oven…is as much of an important ingredient as anything on the pizza itself. A coal-fired oven that burns hot and dry, not wet like a wood fire…an oven that dates back to 1936, when Frank Pepe moved from his original bakery location to a spot right next door, where it still stands today, at 157 Wooster St. That means my pizza “touched” every other pizza made at Frank Pepe’s…perhaps even a molecule of Frank’s first pie touched mine. Whatever…my first bite was pure magic. My daughter’s reaction to the margherita was the same. The pies were huge, so we boxed up whatever we couldn’t finish and brought it home. 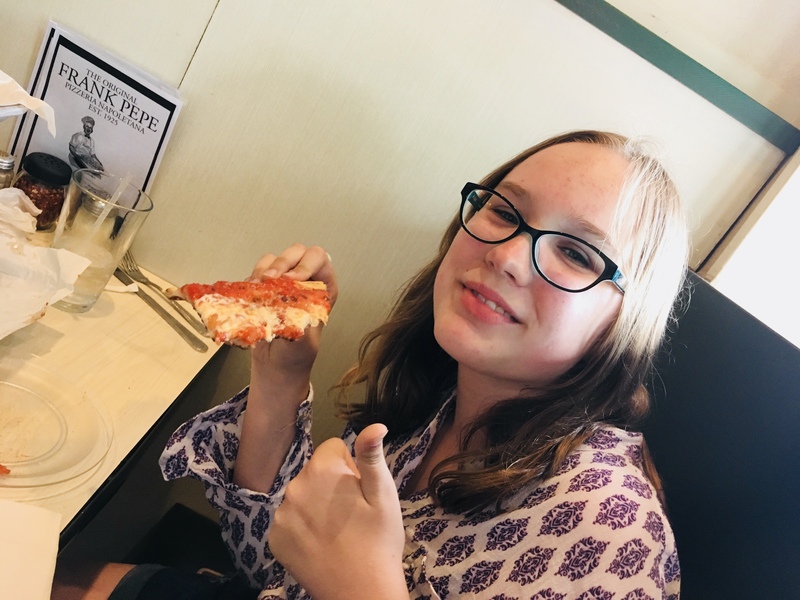 When I asked my daughter what she wanted for dinner that night, she simply smiled and said: “More of that pizza!” I couldn’t agree more! 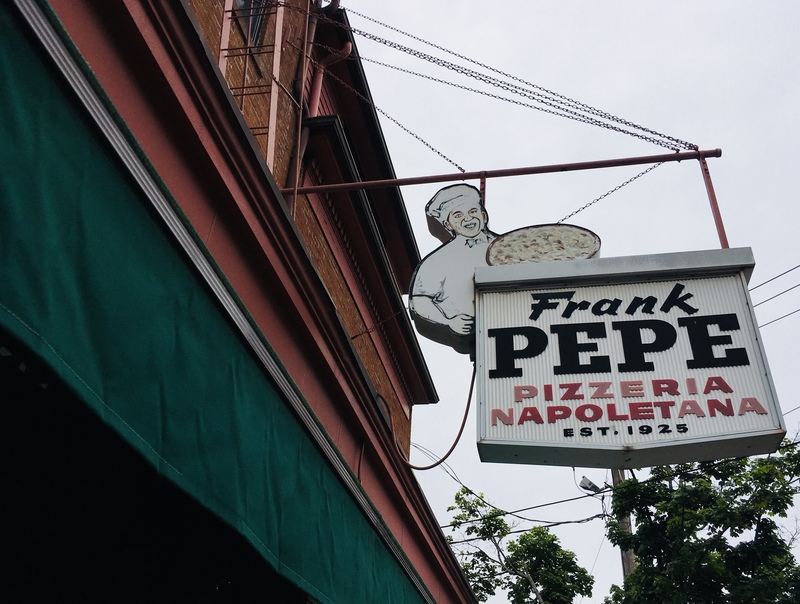 Frank Pepe’s now has 10 locations in Connecticut, New York, Massachusetts, and their newest location: in my little state of Rhode Island. But for me, the only place to go is New Haven: the oven, the atmosphere…you can’t replicate that anywhere else. That hook hanging from the ceiling holds the handle of the long pizza peel in the air so they don’t smack into it. (See the peels on the left.) The pizza oven is so deep, they can go about 4 pizzas deep at one time. It takes a real pro to keep them all cooking perfectly. 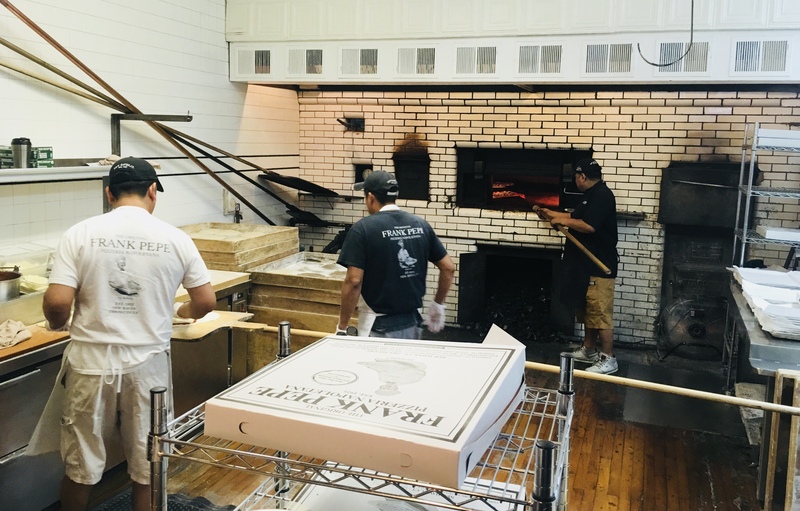 A side note: Frank Pepe originally opened a bakery in 1925 at 163 Wooster St., now doing business as Frank Pepe’s the Spot. When he got tired of baking and delivering bread, he decided he would start making pizza, so that his customers would come to him instead. 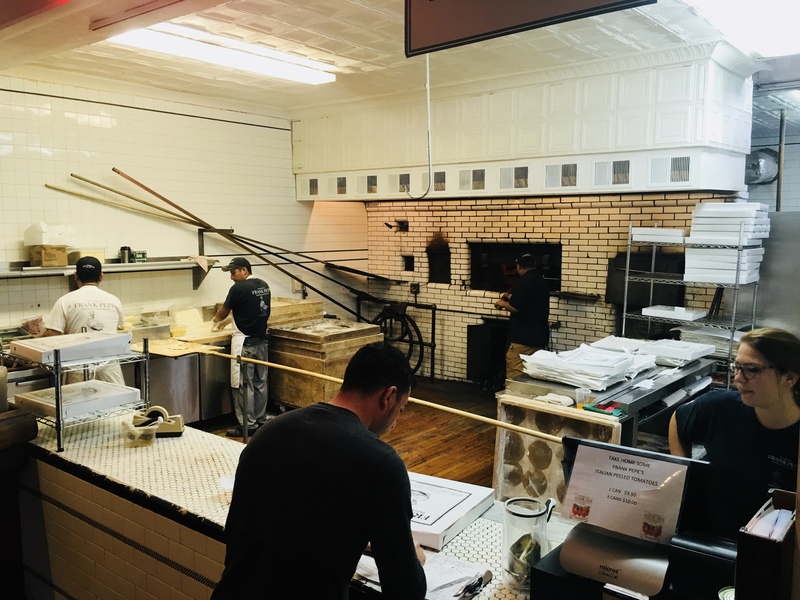 He sold that bakery to move in next door at 157 Wooster St., in 1936, and that’s been the location of Frank Pepe Pizza Napoletana ever since. 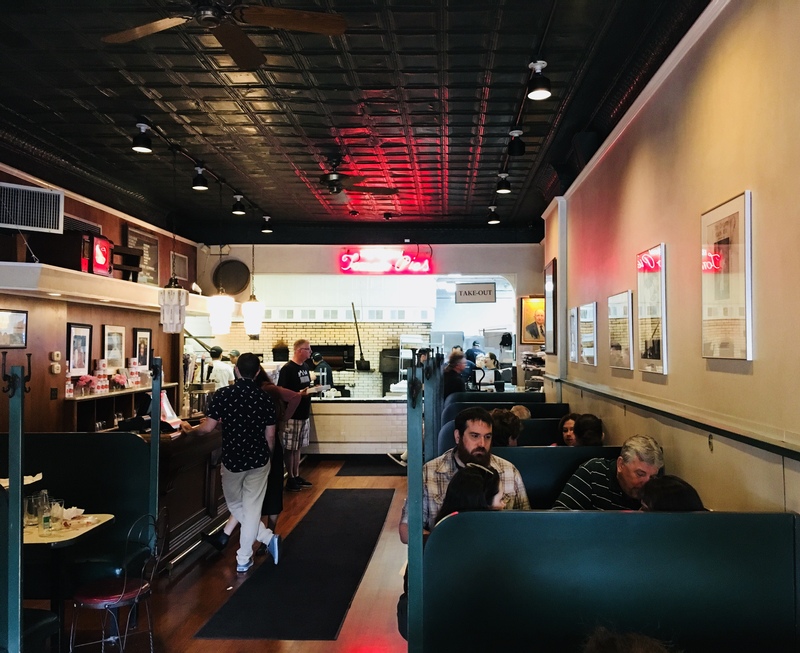 Frank’s daughters bought back the bakery years later, and so now you can visit either location for a taste of history. 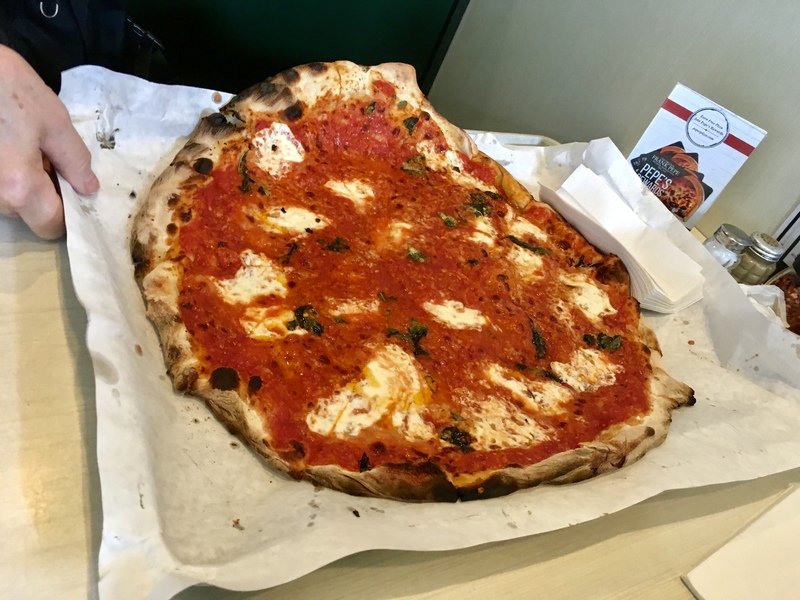 And Frank’s nephew, Salvatore, opened his own pizzeria: Sally’s Apizza, a must-stop for me the next time I’m passing through New Haven. 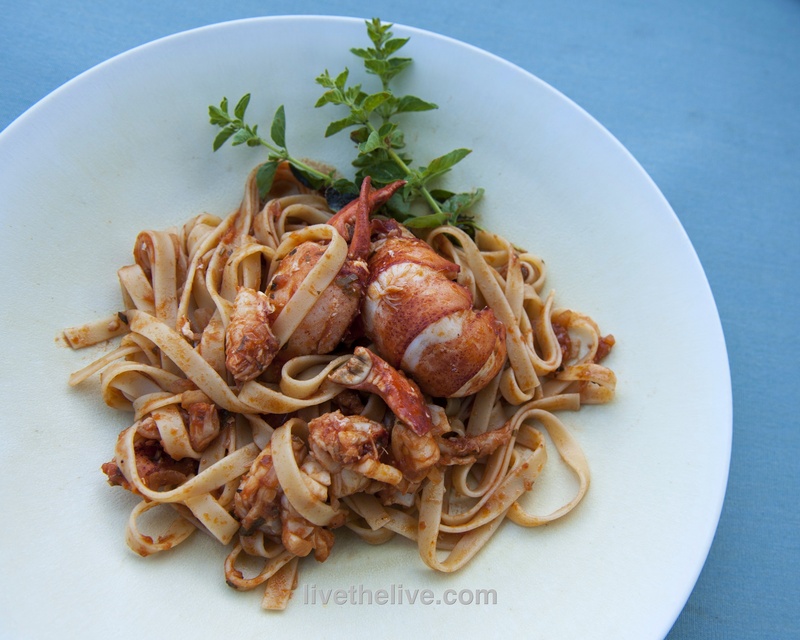 One of the most incredible dishes I’ve had on the beautiful island of Santorini, Greece, is lobster with pasta. It’s one of those dishes that takes time to prepare, because the pasta lobster sauce they make is a labor of love…time consuming, but so spectacular. I often have friends over for dinner, but when I prepared this dish for them recently, it was the first time they all licked their plates clean! Place all the ingredients in a large pot and set it on high heat. 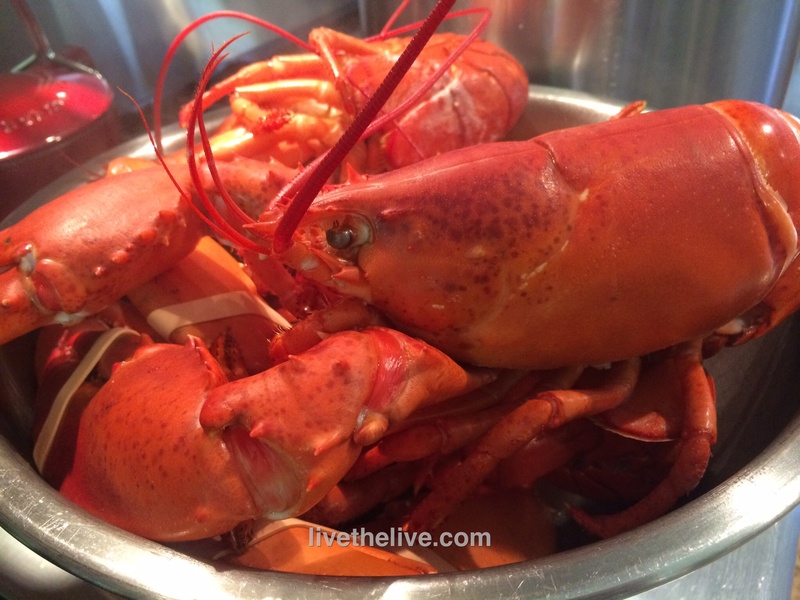 Crush the lobster shells (I use a potato masher!) Cook until the stock is reduced by half. Strain the stock, discarding the lobster shells and veggies. Bring the stock back to the heat and reduce it until all you have left is 1 cup of intense stock. Now that you have the stock, you can make the sauce! Add some olive oil to a pan and saute the onions until translucent. Season with salt and pepper. Add the garlic and cook for 10 seconds. Add the red pepper flakes and parsley. Add 1/4 cup of the lobster stock and let it cook, reducing by half. Add the other 1/4 cup of lobster stock and then the tomato sauce. Let it cook for a couple of minutes and add the white wine. Cook for a few minutes more. Cook the pasta and drain it even before it reaches the al dente stage. Place the pasta in the pan with the sauce, heating and coating it thoroughly. Serve immediately, with or without the lobster meat. For the San Marzano tomato sauce: I pour a can of San Marzano tomatoes into a food processor or Vita-Mix and blend until I get sauce. Pour into a pan and reduce over medium heat by half, until sauce has thickened. 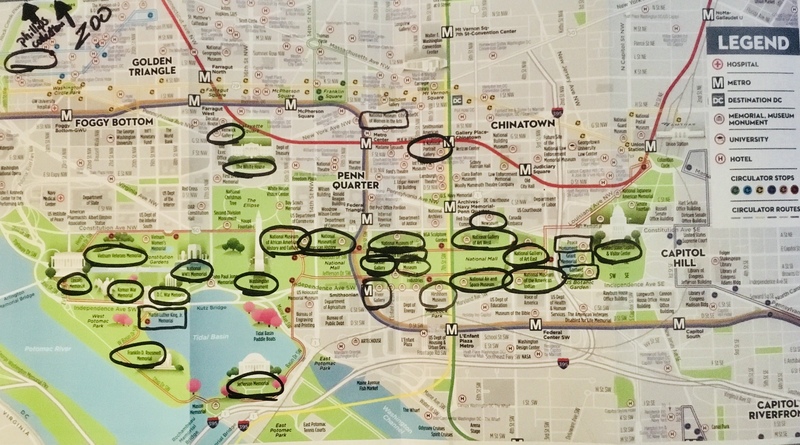 Washington DC is an incredible city, and if you’re willing to walk–a lot–there’s a lot to see. 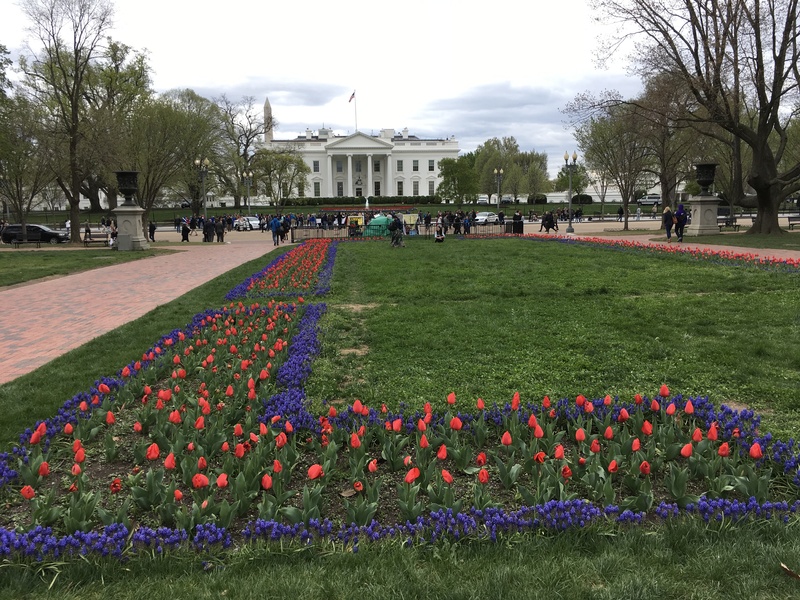 In our 7 days, we visited 17 museums and 14 monuments. 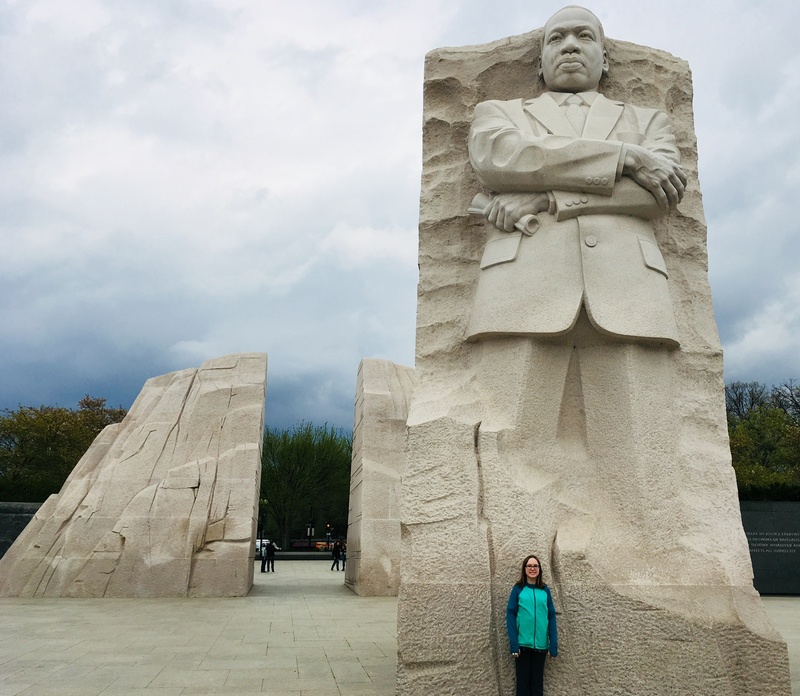 You could say we were on a mission: my wife, the artist, needing to visit every art museum in town, and my 11-year-old daughter, learning about history in school, needing to feed the brain with endless historical information. All of the museums associated with the Smithsonian are open every day of the year except Christmas, and admission to all of them is free. Once you realize how amazing that is, you don’t complain about the $15 fried chicken plate at the cafeteria. They have to make their money somehow! 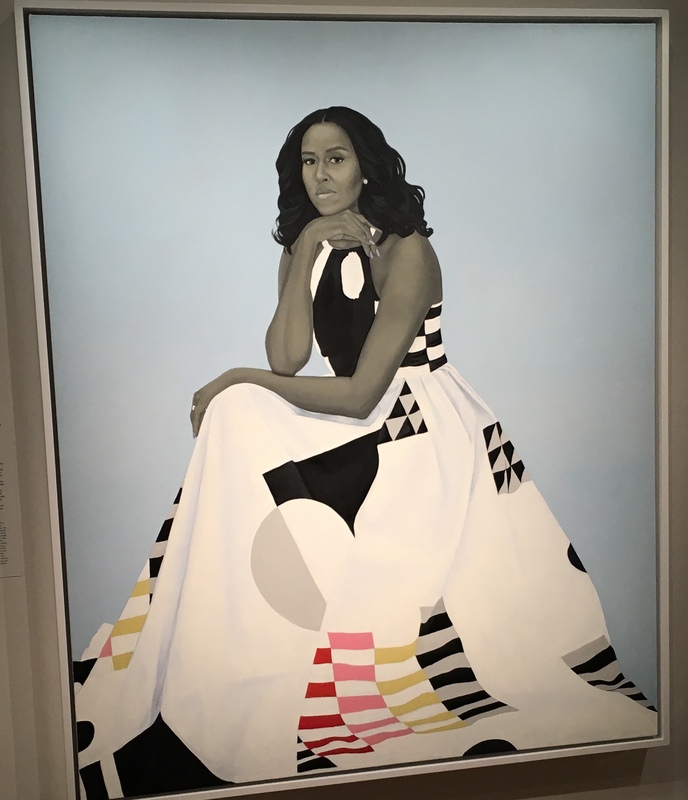 The National Portrait Gallery holds the official portraits of all the Presidents of the United States, as well as some portraits of First Ladies. 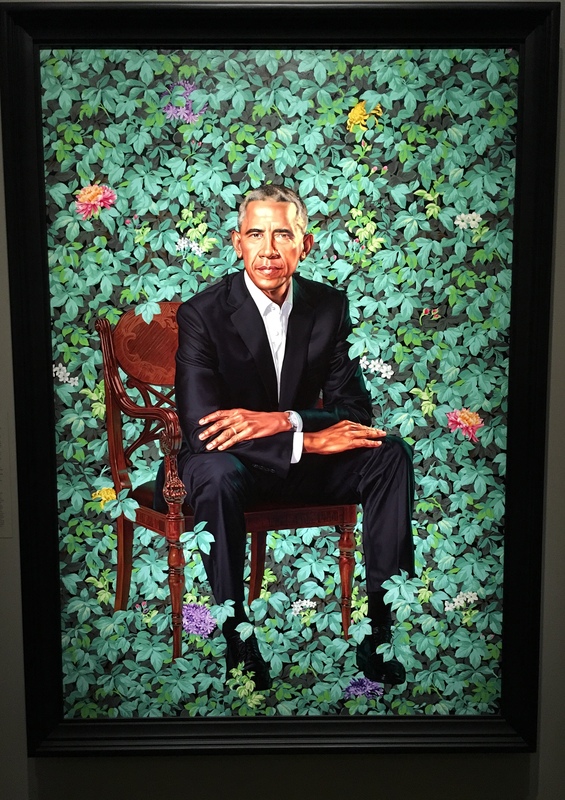 Most notably, they recently installed the official portraits of Barack and Michelle Obama. Incredible to see them in person! The toughest ticket to get, by far, is getting into the National Museum of African American History and Culture. 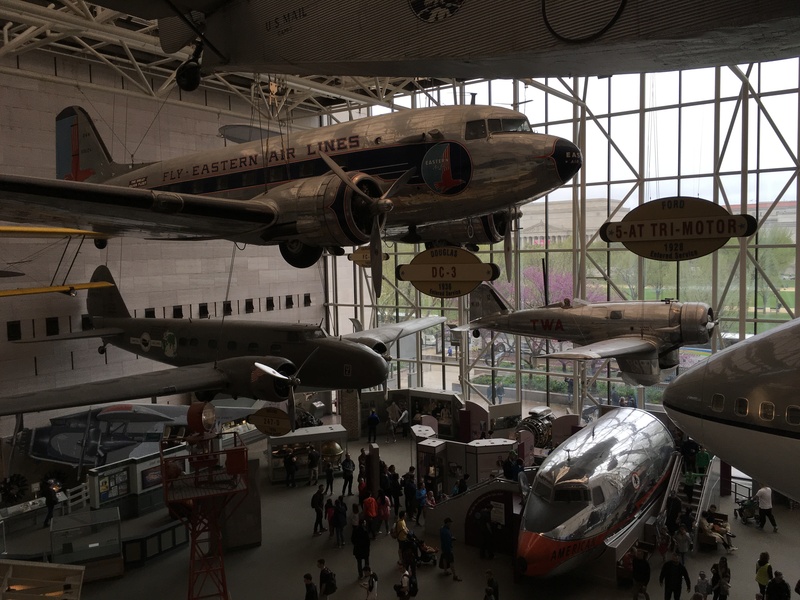 The reason is that, unlike all the other Smithsonian museums, there really is an actual ticket you must have to get in. They limit the number of people who can visit every day, and you have to work a bit to be one of the lucky ones. It’s worth the effort. An architectural marvel with three stories underground and three above, the museum starts with the first days of slavery and brings you to current times. Along the way, it’s an incredible emotional ride. 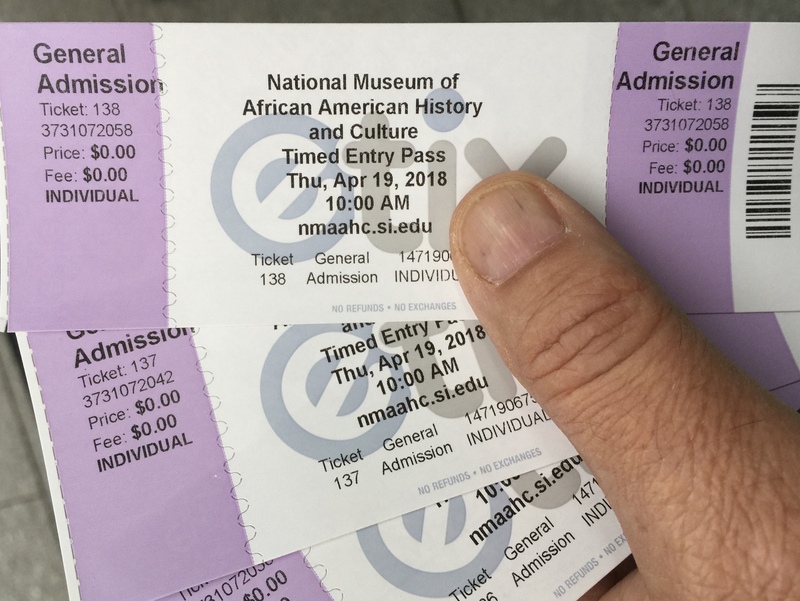 So if you want to get into the National Museum of African American History and Culture, here’s how to do it: First, they offer tickets online months ahead of time. Go to their website:(https://nmaahc.si.edu/visit/passes) to find out more. Or…the day you want to go, get on your computer at 6:30AM! Tickets are distributed in half-hour time slots for the day. And they sell out FAST. Or…your third chance to get a ticket is to walk up to the museum entrance on Madison Drive and get on a special line every weekday at 1PM, where they hand out a limited amount of tickets for that day and time. (They don’t offer these tickets on weekends.) We missed out on the first two possibilities, so we walked up and stood on line at 12:15PM and were handed tickets almost immediately for that day. We got lucky. 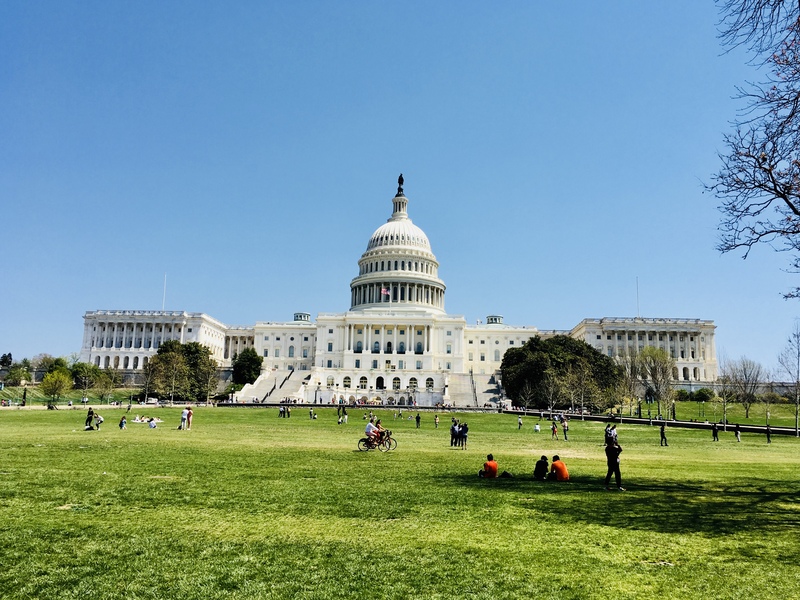 The Capitol, at one end of the National Mall. 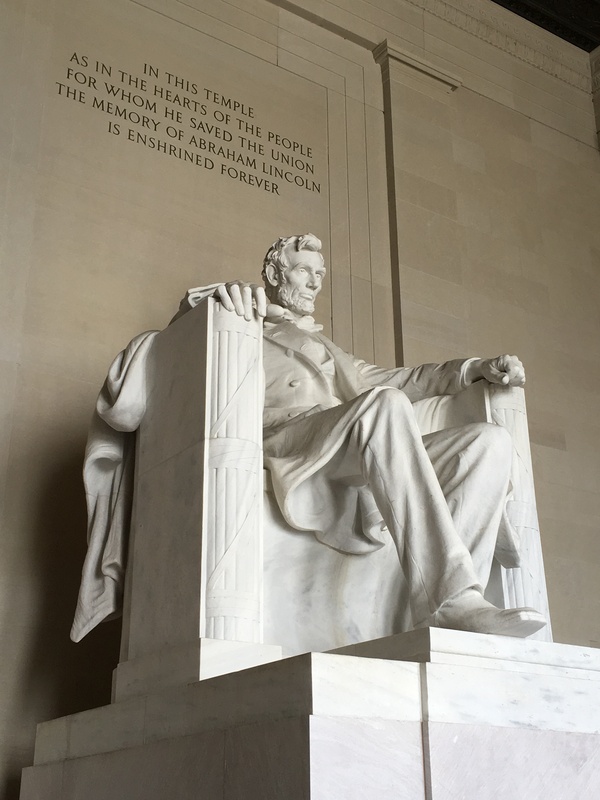 As for monuments, there are plenty of them to see as you walk the National Mall, and my daughter wanted to see them all! The weather wasn’t cooperating much on our spring trip, raining sideways at times, but we powered through and saw just about all of them! 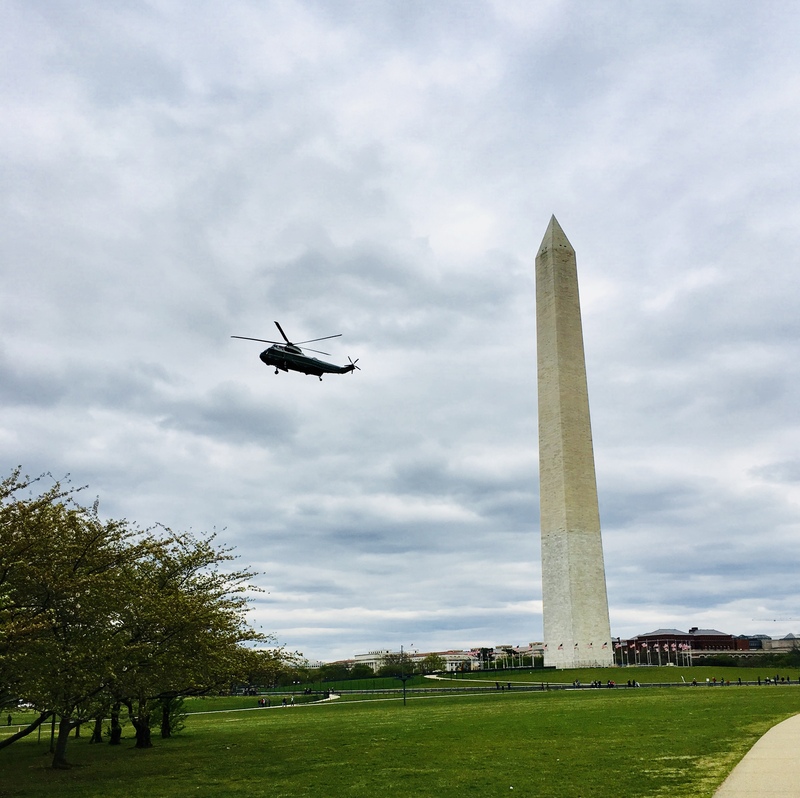 One of the Presidential helicopters flying past the Washington Monument. 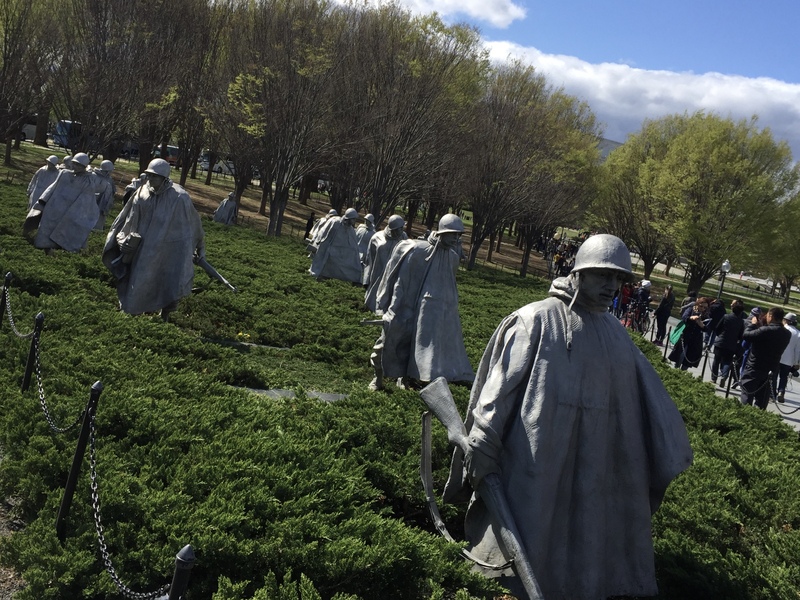 The Korean War Memorial…one for my Dad. The Rev. Martin Luther King, Jr. Memorial. Awe-inspiring. 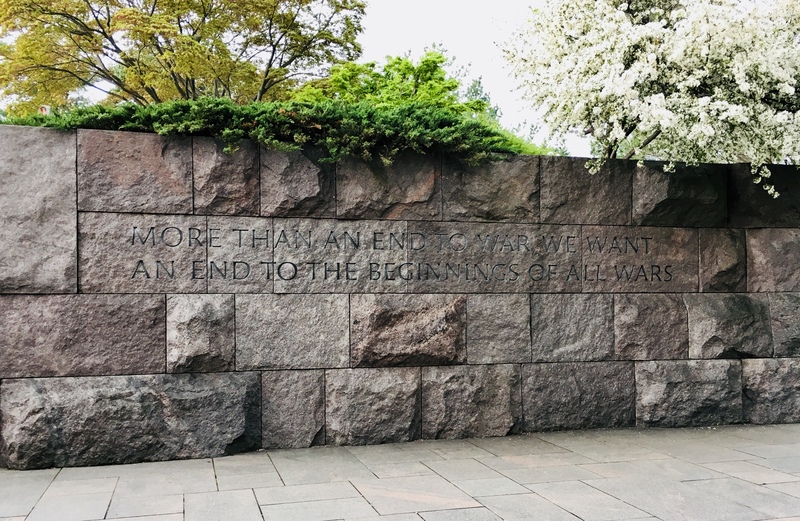 The words of FDR at his memorial. If you’re interested in touring the White House, you can only get in with passes through your local Congressman’s office requesting passes way ahead of time. We were happy to simply see it from the outside. We just headed for Pennsylvania Avenue. The National Zoo, a part of the Smithsonian, has free admission as well. Being a New York boy who grew up on the Bronx Zoo, I wasn’t hugely impressed by the National Zoo. But, I did see the pandas, and that made the trip worthwhile! 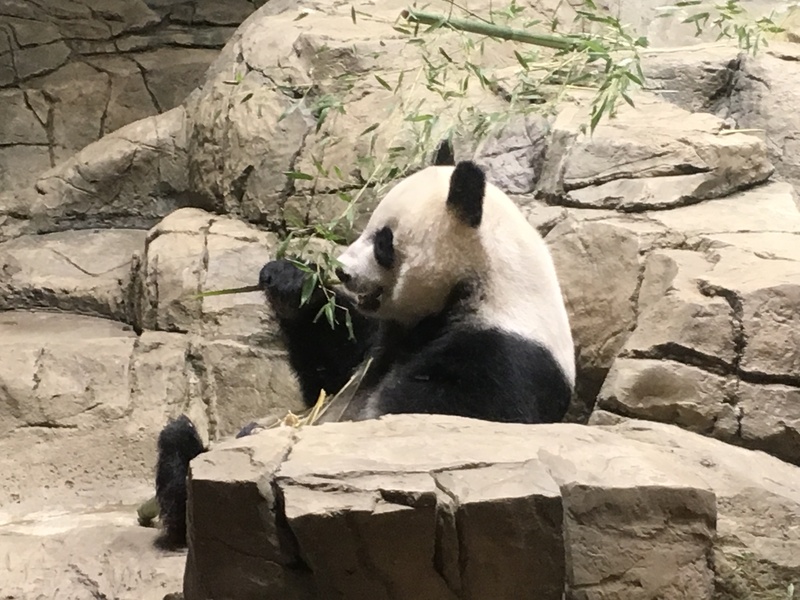 Tian Tian, the male, enjoying his bamboo snack. 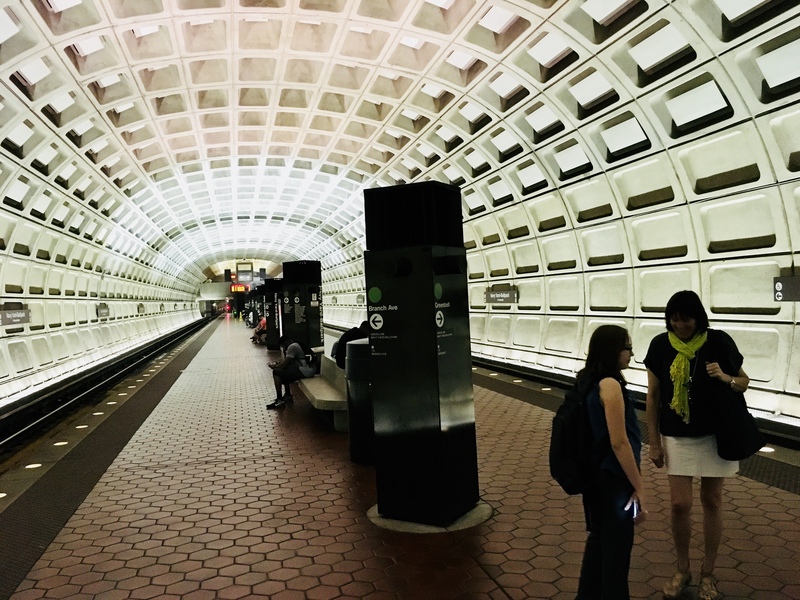 Finally, when visiting Washington DC, skip the rental car and be sure to use the Metro. It’s a great, cheap way to get around town. It sops close to most of the museums, though you’ll need to walk a bit for the monuments and memorials. The Metro: super easy to use, super cheap. For me, no dining experience is complete without a great cocktail. If all they’ve got to offer is a martini straight-up with olives, I’ll drink it alright–but I’ll be disappointed there’s nothing more. The food was incredible, and this drink, called “Hey, Neon,” was inspired. 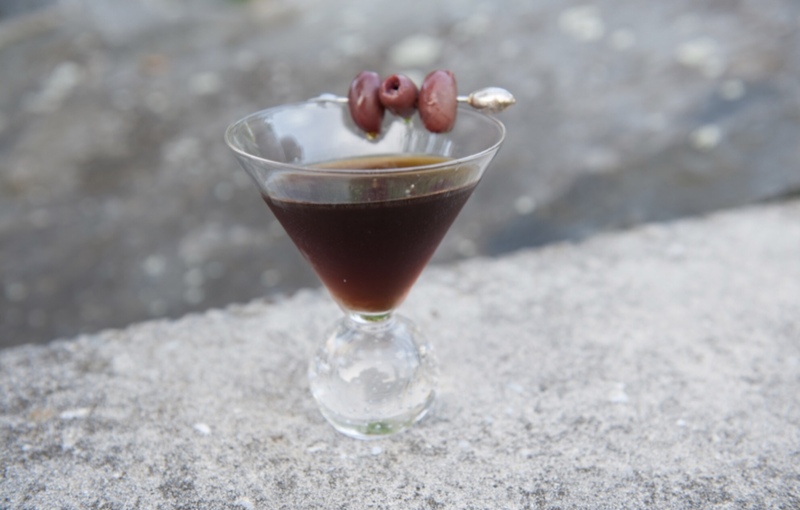 The glass was rimmed with dehydrated and finely chopped kalamata olives. I tried to recreate that at home, and couldn’t get the texture or the size right. And I could never get it to stick to the glass, either! Ultimately, I simply skewered a few kalamatas and placed them on the glass! The original “Hey Neon” at Coppa. Add ice to a cocktail shaker and then add the ingredients. Stir well, until very cold. Strain into a martini glass. Add the skewer of kalamata olives. Aalborg is a brand of aquavit (or akvavit), a clear alcohol similar to vodka but usually infused with other flavors, mainly caraway or dill, popular in Scandinavia. Punt e Mes is a sweet vermouth, the so-called “little brother” of the granddaddy of all sweet vermouths: Carpano Antica Formula. Cynar is an Italian bitter and digestif made from herbs, plants and artichokes. Strong in flavor, but delicious! Chartruese is a French liqueur made by Carthusian monks since 1737, using a recipe that dates back to 1605. It contains 130 herbs and plants. It’s also one of the few liqueurs that ages in the bottle, changing over time. Green Chartreuse is 110 proof, and naturally colored from the maceration of its ingredients. 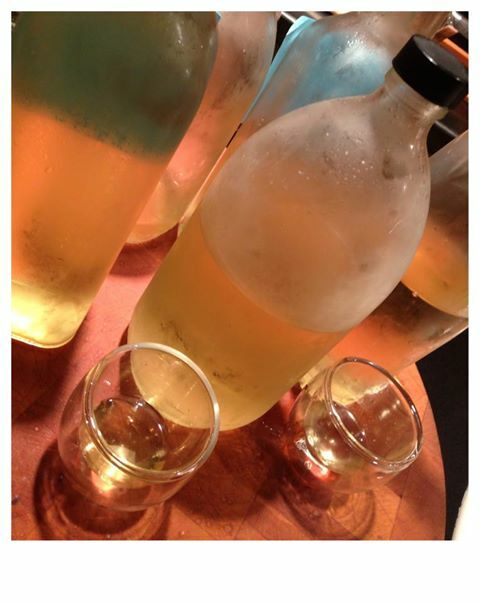 Yellow Chartreuse, at 80 proof, is a milder and sweeter version. Every major city in the United states has a Capital Grille, and it’s a great place to grab a solid dinner if you’re traveling. Although the Capital Grille in my town of Providence, RI has recently moved from its original location, we can still boast that we had the very first one in the USA. They don’t do crazy-fancy drinks at the Capital Grille. They keep a very well-stocked bar with high-end booze and make solid cocktails. But there is one signature drink you can find there, and that’s the Stoli Doli. 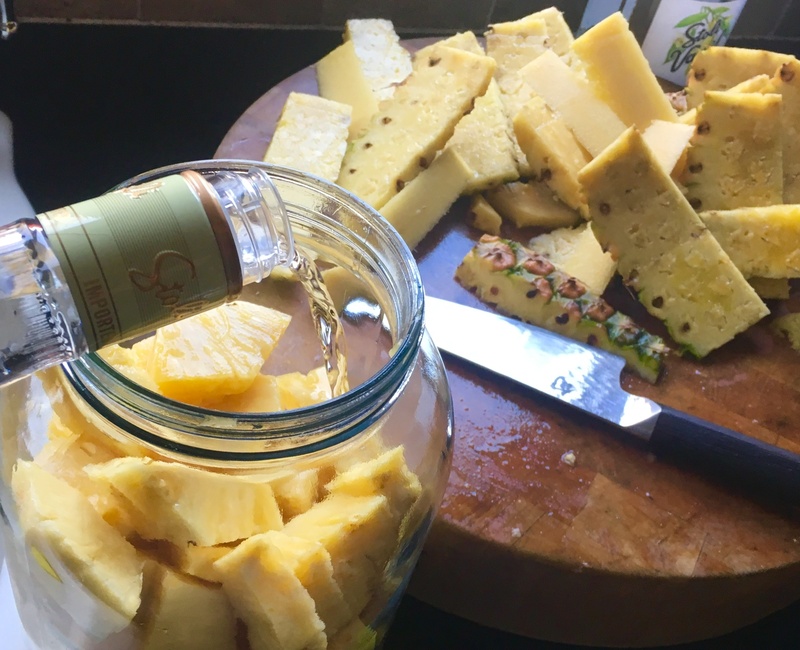 A Stoli Doli is simply Stoli vodka that has been infused with fresh pineapple. If you sit at the bar at the Capital Grille, you won’t be able to miss the very large jar of freshly-cut pineapple pieces swimming in vodka. 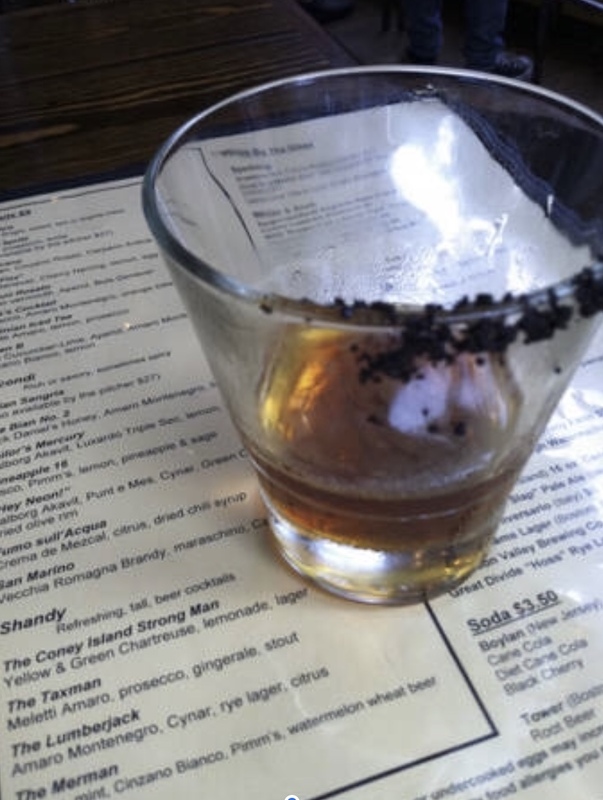 They literally pour it “from the tap,” and serve it straight up, like a martini, or on the rocks. It’s delicious, and I’ve certainly had my share of them over time. Find a gallon-sized glass jar with a lid. Peel, core and slice the pineapples and drop the pieces in the jar. Pour the vodka in, mix well, and seal the jar. Keep it at room temperature for a week, giving it a gentle shake every day. After one week, strain it, squeezing the pineapple pieces to get every bit of liquid out. Keep the Velvet Elvis refrigerated. Serve over ice. On the surface, the idea of frequent flyer miles is a great one: rack up a bunch of miles for every flight you take or associated credit card you swipe, and before you know it, you have enough miles to fly somewhere on this planet for free! It’s a system that has allowed my family to travel far more often than we could otherwise. We flew on points to Spain…New Zealand…Paris…Lithuania…Greece and more. But the battle to get there can be a tricky one, and you need to know how to play the game…a game where the rules can change without warning. Rule 1: One airline, one card. If I’d collect points from a handful of airlines, I’d have just as many points, but they’d be spread out–not enough to get anywhere on any one airline. And airline cards can be expensive. When Delta raised the yearly fee of their card to $185, I told them to go pound sand. Now I only use an American Airlines Aadvantage Mastercard and literally put every single possible purchase I make on that card because American Airlines is convenient for me. 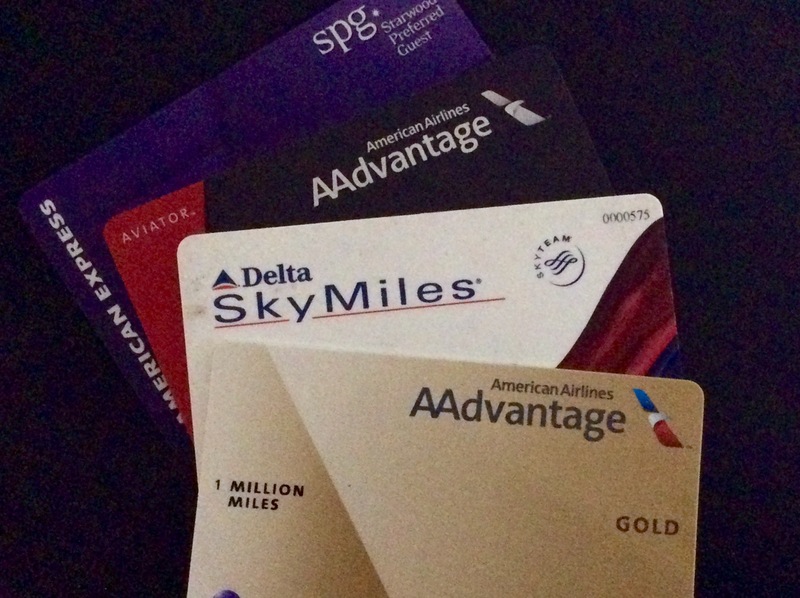 All the airlines have some kind of card, so do a little research and decide which one works best for you. By the way, I do cheat on the “one card only rule:” I also have a Starwood Preferred Guest American Express card. I’ve found that I get the most bang for my buck with the Starwood group of hotels. They include Westins, W’s, Sheratons, St. Regis, and more. And now, Starwood has joined forces with Marriott, increasing the number of hotels I can use. Rule 2: No expense is too small to put on the card. A burger at a drive-thru, a couple of things at the supermarket. Every point counts, and once you get that ingrained in your brain, you’ll make serious headway. I pay all my bills with my credit card, when possible: utilities, cell phones, the post office, doctors visits. Even most appliance or house repairs can now be paid by credit card, so why write a check? Rule 3: Pay your credit card off on time. The reason why it’s worth collecting points with your credit card is because you’re making purchases you would’ve done with cash anyway. The moment you get to the point where you’re paying interest on your credit card, you’re paying more per point, and then you may as well give up the fight and just buy your plane ticket. Rule 4: Don’t let your miles expire. You worked hard to collect them. Always check to make sure your miles aren’t going to expire before you can use them. Sometimes all it takes is a simple credit card transaction to buy yourself and extra year’s life on your miles. Rule 5: Do the math. If you’re flying somewhere and have enough miles for a free trip, check out the deals on your flight before you use your miles. If you can get a really cheap flight, you’re better off paying for it, and saving your miles for a future trip that might cost a lot more. Rule 6: Look into upgrades. Sometimes you don’t have enough miles to buy a whole ticket but you might have enough to upgrade yourself from coach to Business Class. A nice perk if you’re going on a long flight! Rule 7: When possible, book it yourself. Sometimes you can do all of your trip planning online. If you’ve got a simple round-trip flight, you can save yourself some money by booking it yourself. If you use a representative on the airline’s 800-number, there could be a fee of $40 or more for them to book it for you. But if you’ve got a more complicated route, with several stops and different cities, you may decide that a live person on the phone is the way to go. Rule 8: Go First Class, even if you’re not flying First Class. When looking for flights online, I’ve found that I get better flight choices if I say I want to go First Class, even though I know I don’t have the points to do it. If I tell the airline upfront that I want to fly coach, they automatically treat me like a second-class citizen and show me trips that require several stops to get to my destination. If I tell them I want to go First Class, lo and behold, I get non-stop flights! Once I get to those flights, it’s often easy to downgrade to coach, but now I have a non-stop flight instead of a 2 or 3-stop flight. Rule 9: Computers won’t give you answers to questions you don’t ask. I was trying to book 3 Business class seats. Every time I looked on-line, I was told no. Then it dawned on me: see if there are 2 Business class seats on the flight I want. Bingo! The computer only told me what I asked for: 3 seats not available. It didn’t volunteer info for any alternatives. So I booked the 2 good seats for my wife and daughter, and I grabbed a 3rd seat in coach for myself. A little sacrifice, but worth it since we had the flight we wanted and we were all on the same plane. Rule 10: Hang up!! This rule has helped me the most with hotel reservations and especially with airlines. If you call the 800 number, and the representative that answers the phone seems clueless or refuses to help you to your satisfaction, HANG UP AND DIAL AGAIN. There are hundreds of people answering those phones. Some will be good and some will be totally clueless. I’ve found that younger people are hard-working but are afraid to bend the rules even a little because they want to impress their boss and keep their jobs. 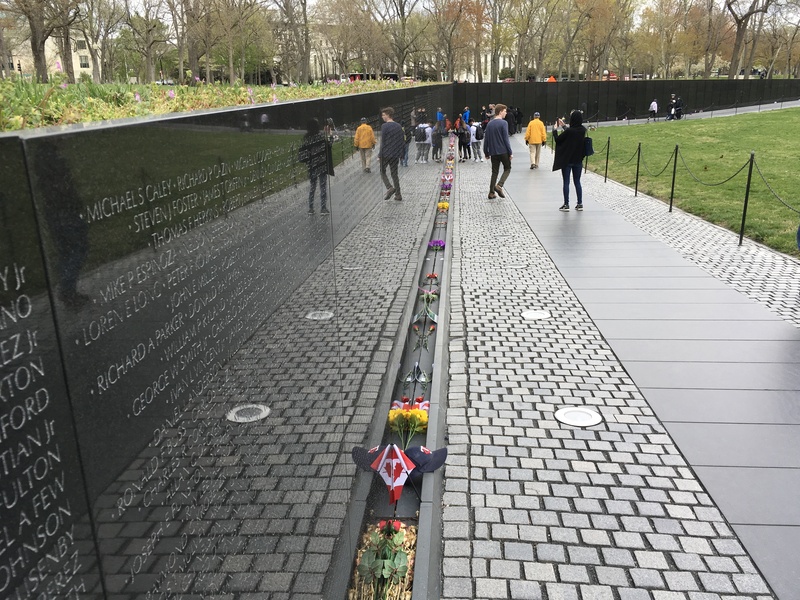 The veterans are more interested in impressing you and are experts in finding ways around the rules that the young people haven’t figured out yet. Don’t ever settle. This is your big trip! A great rep on the phone can make all the difference.